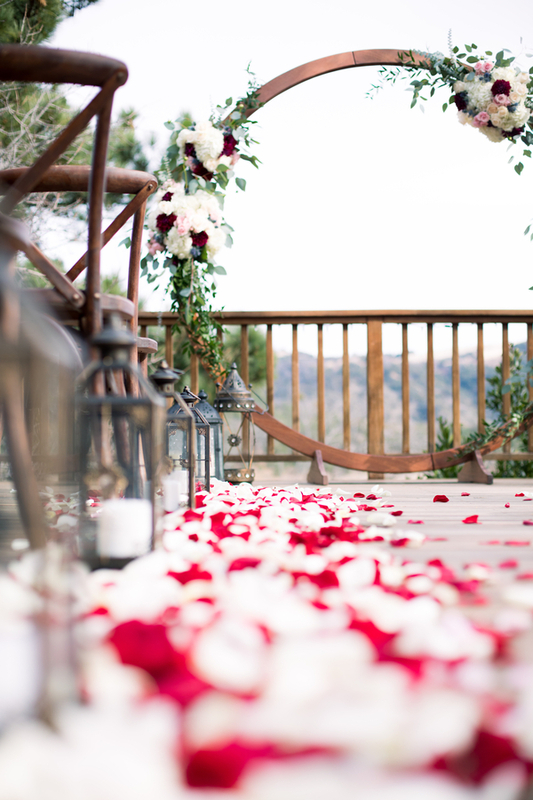 What do you say to stunning 360° views that allow you to drink in everything that is So Cal wedding beauty at Emerald Peak Venue?! We say yes! 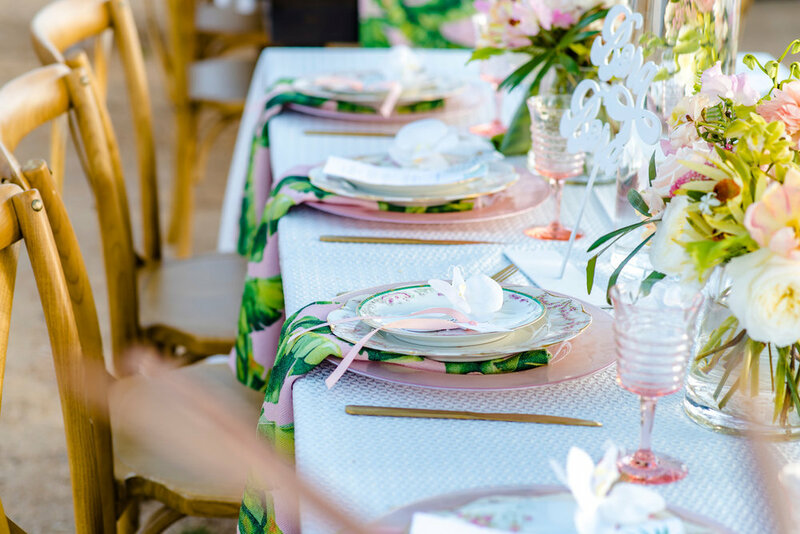 This exciting tropical inspired styled wine country shoot hosted by Alexandra David, Creative Leader for this Styled Shoots Across America event, brought together some fabulous and popular trends: sweetly bright coral tones, joyful floral displays, and a surprising pop of palm leaves playing off the rustic vineyard elements make for a truly unique-to-So-Cal aesthetic. 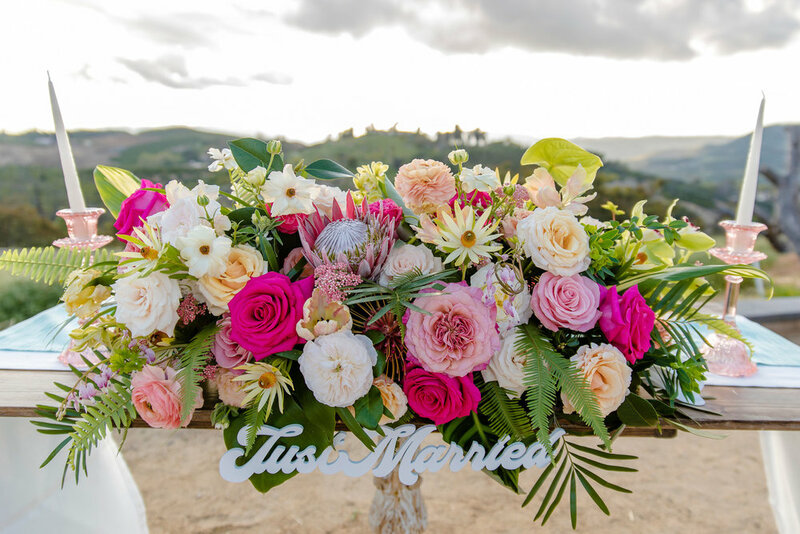 All of this wedding gorgeousness adorned an elevated plateau that overlooks the surrounding vineyards, where beautiful stations awaited their allotted time in the light. And OH! What light there was! The models were at their brightest and most polished, reflecting the bright, beautiful and colorful mood of the day. From unique balloon-scapes, to a vintage three wheeled mini-truck, converted into a mobile craft beer bar, the colors popped, but the balloons did not! 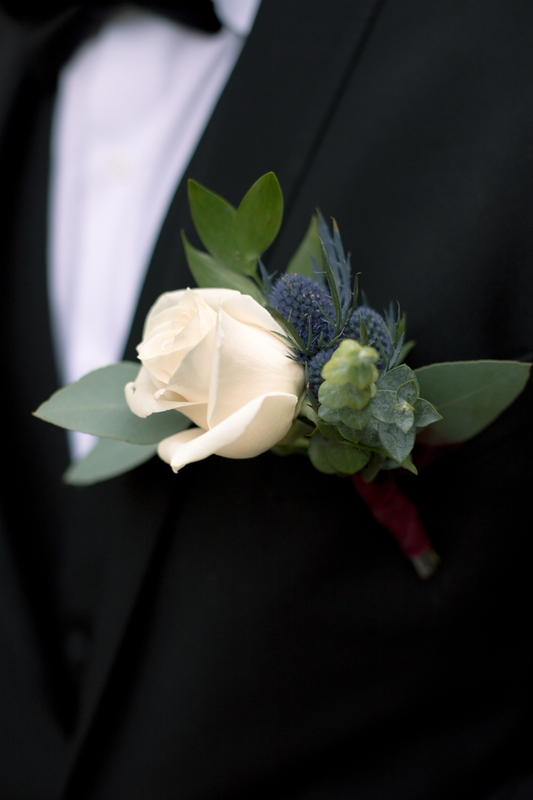 Thanks Alexandra for this pop of freshness and purely perfect style! 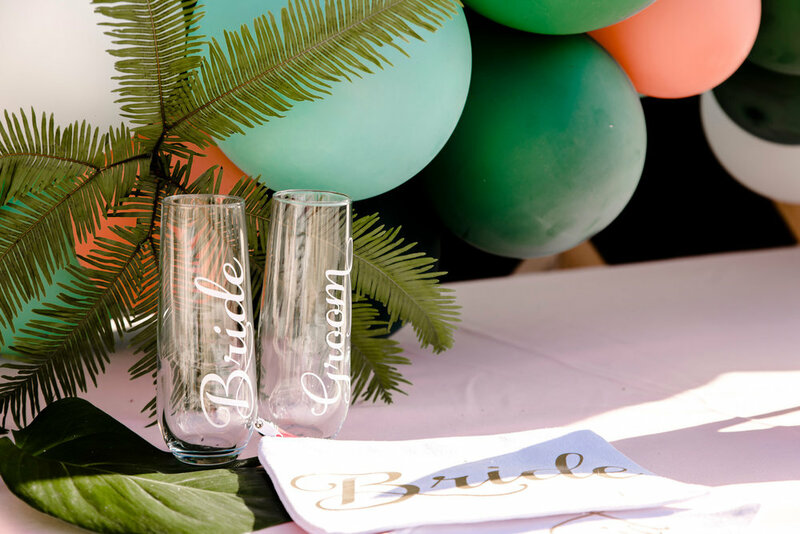 Whether you are looking for a rustic country feel, a vintage chic look, or a classic ranch style wedding Emerald Peak is the perfect canvas to create your wedding! 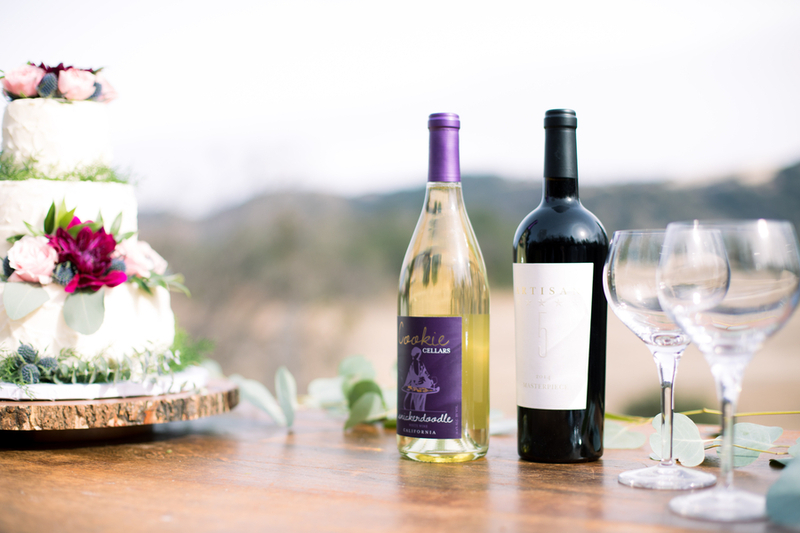 Emerald Peak is tucked away in Temecula, California on a secluded hilltop with 360-degree views of orchards, vineyards, and canyons. 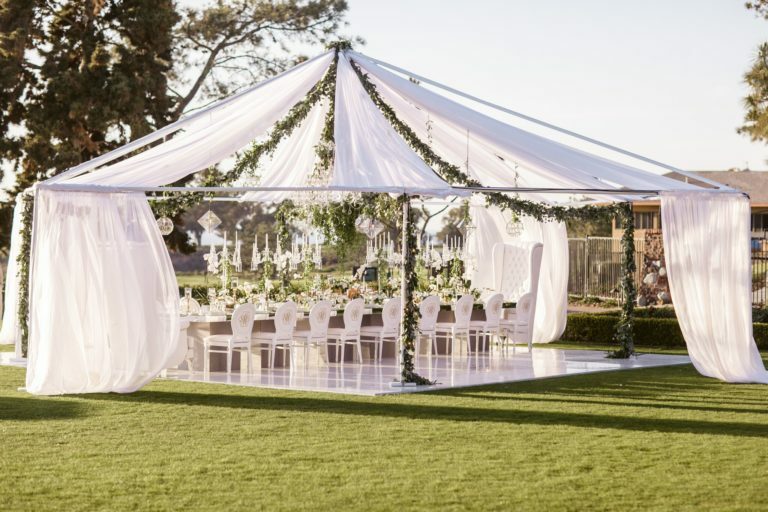 Emerald Peak’s rustic country style venue with a dazzling view of the coastal landscape is the perfect atmosphere for you and your guests to enjoy a truly So Cal celebration. 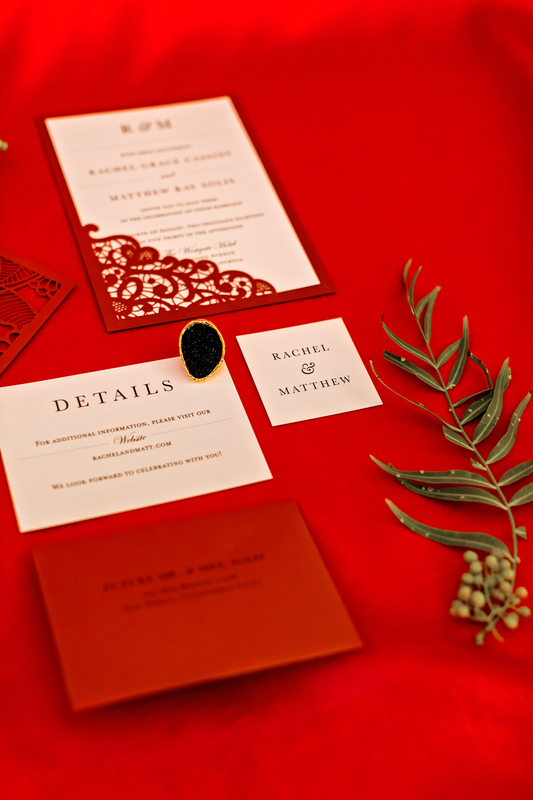 Mystical Matrimony Styled Wedding Shoot is Perfect for the Holidays! 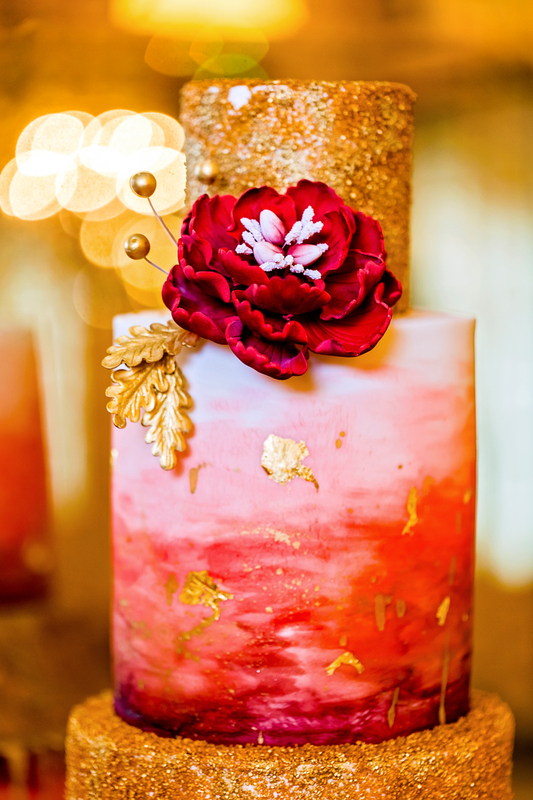 Rich burgundy and plums colors, geode cake [wow! 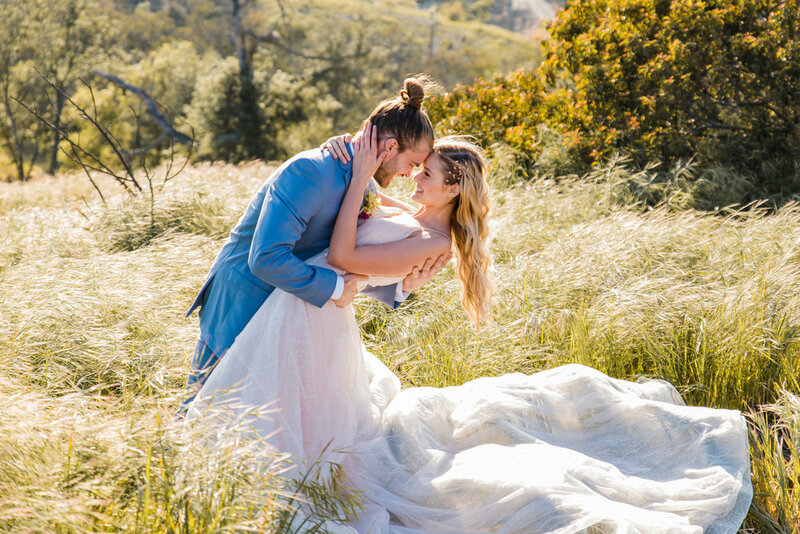 ], gorgeous winery venue and a team of wedding pros who really love working together make for this lovely Mystical Matrimony wedding styled shoot! 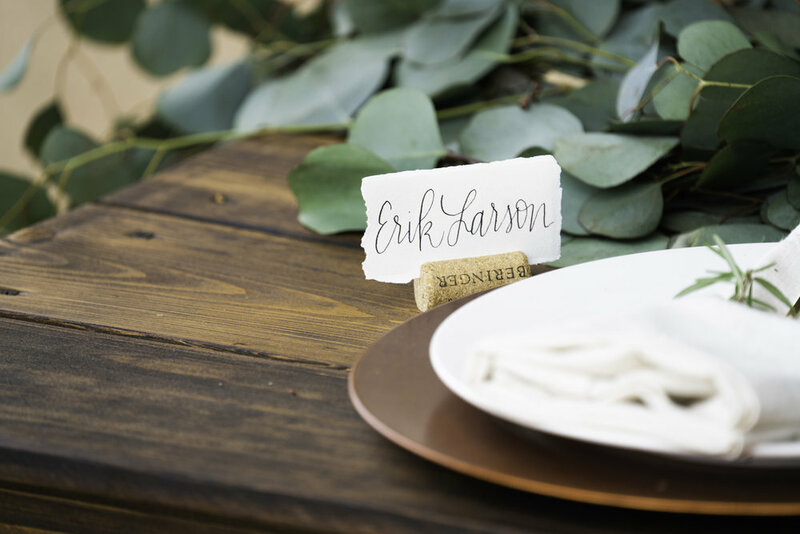 Beach Elopement Styled Shoot is Full of San Diego Sun, Sand, and Real Love! 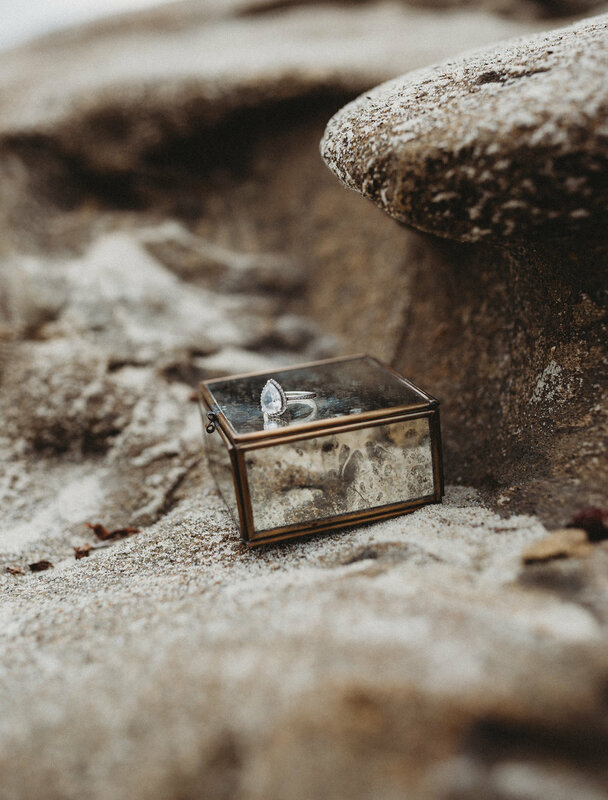 When a real couple let's you style and shoot an 'elopement into honeymoon' styled shoot at the beach get ready for lots of fun and chemistry!! 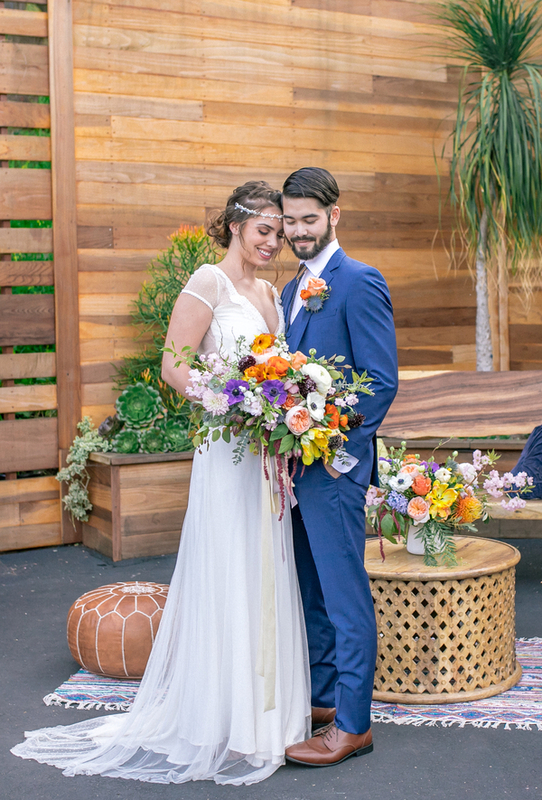 This couple was happy to show their love and passion at WindandSea Beach in South La Jolla. 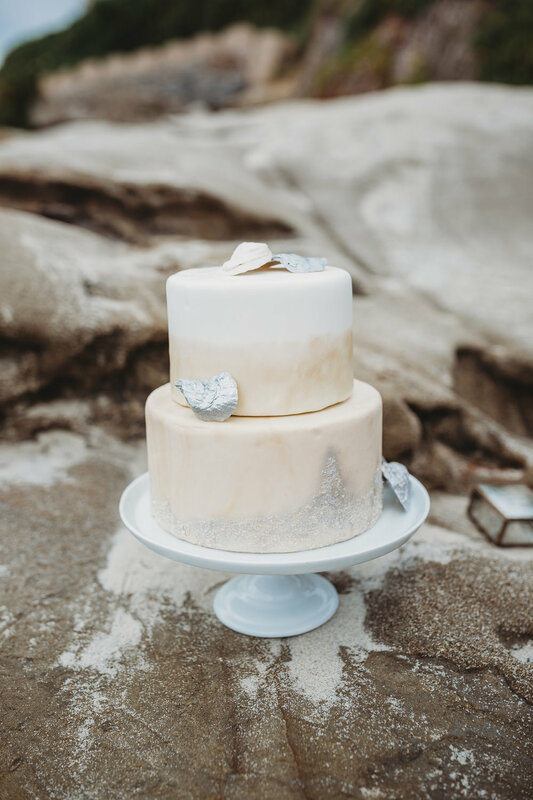 After their beach elopement, they moved into in a "day after - honeymoon" session celebrating their love for one another and the first day as Mr. and Mrs. All we can say is Wow! The heat is on and it's not the soaring Summer temperatures bringing this heat wave! 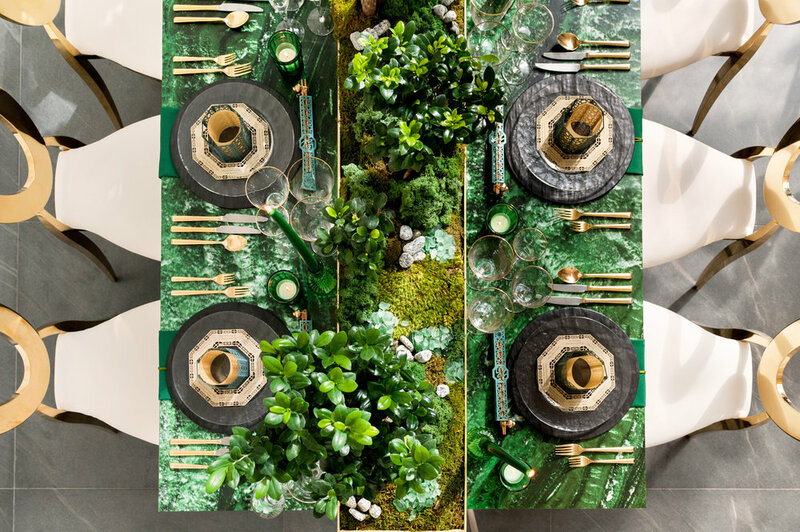 While we are all still recovering from a fabulous British Royal Wedding, here is one last crumb of inspiratiom that celebrates a modern twist on true English style! 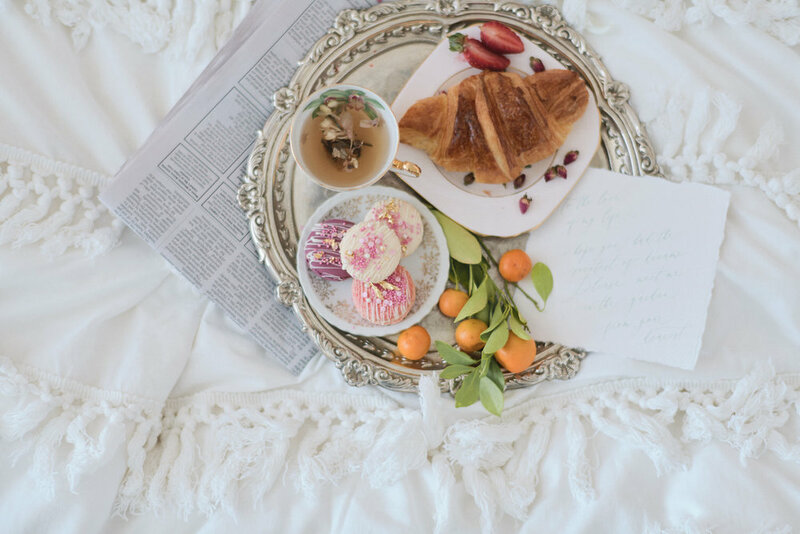 This talented team of vendors, from all the way across the pond, bring a sweet, Anglo style to a lovely tea time styled shoot. 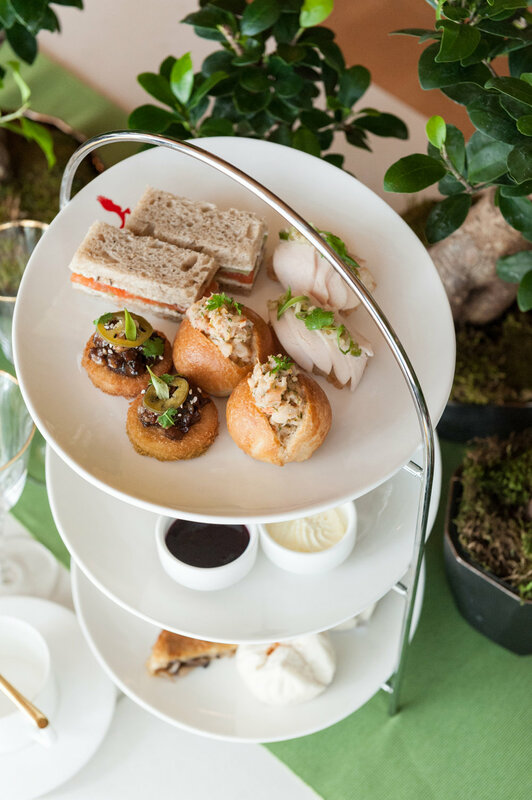 Pass the biscuits! Enjoy! To all our LGBTQ friends and family; we hope you enjoyed a beautiful and love filled Pride Month! 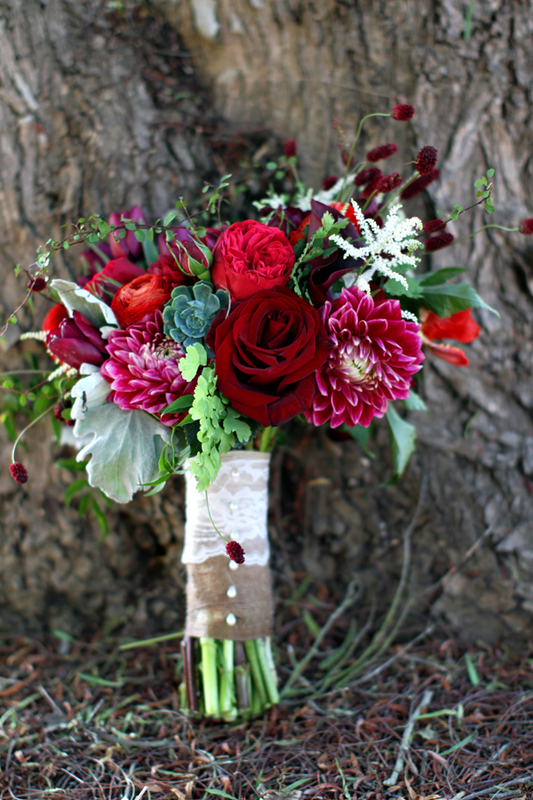 We at SanDiegoWedding.com and #lovetotallyplanlocally celebrate with you that Love is Love every single day of the year. 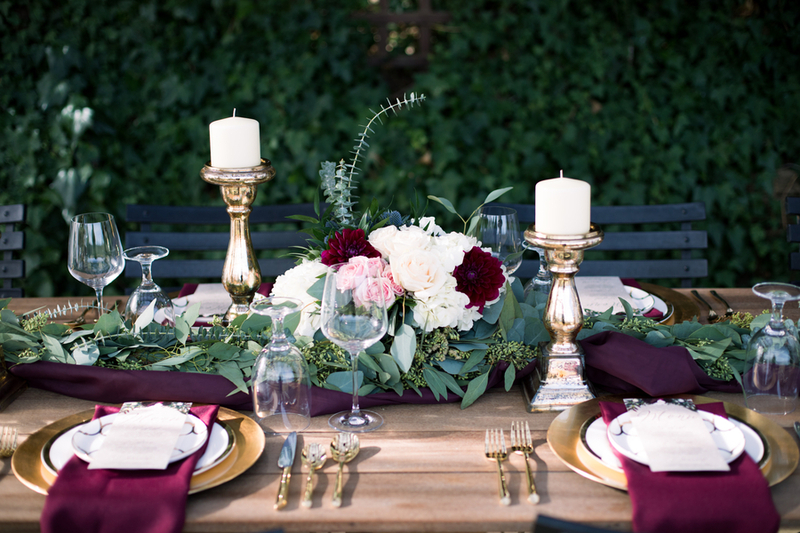 Wine Country Wedding and Styled Shoot Gives an All New Meaning to White Wedding! 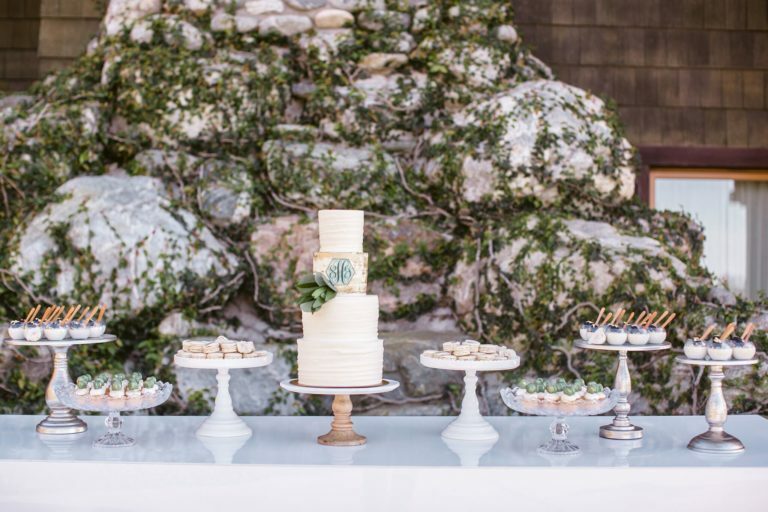 This elegant rustic-chic themed styled shoot utilizes a neutral color palette with a bespoke dress from top So Cal bridal gown designer Madeleine Fig. 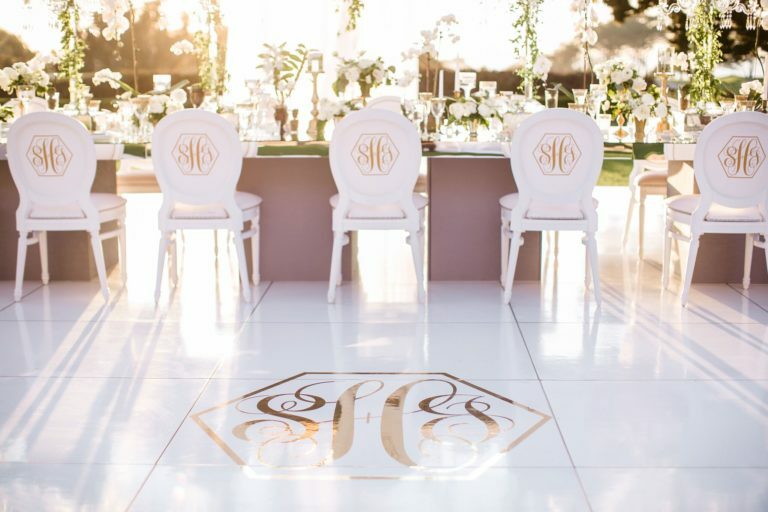 The opulent villa with details like handmade furnishings, stonework, rich wood furnishings and pool, complete with private helicopter naturally, is nestled in the heart of Southern California's incredible wine country. 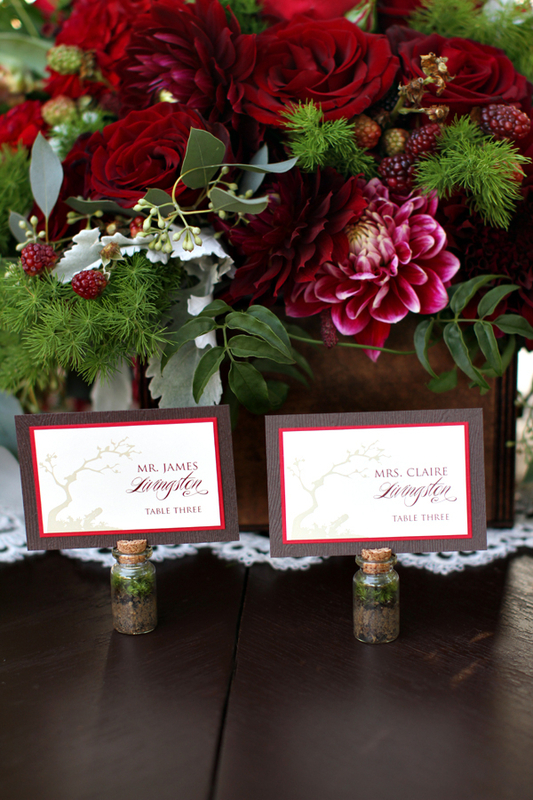 This is sure to inspire couples planning their own intimate destination wine country wedding! 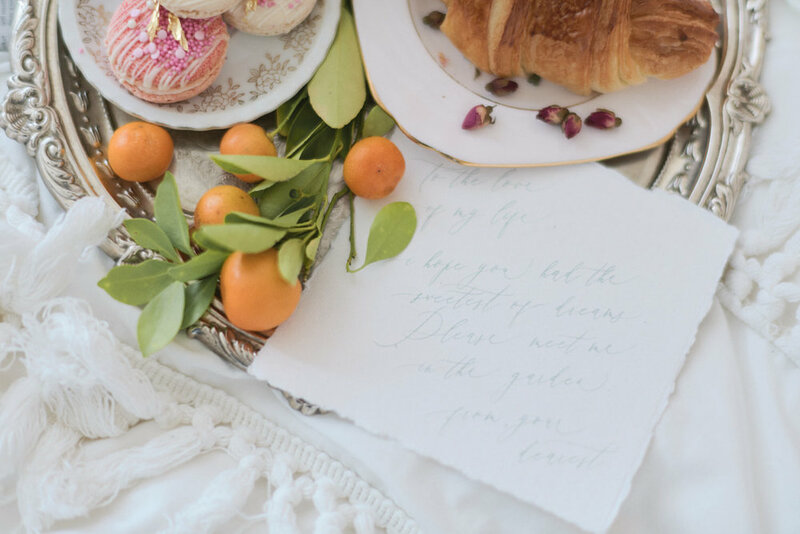 The small-wedding / elopement trend with several unique elements served as the inspiration behind this shoot. 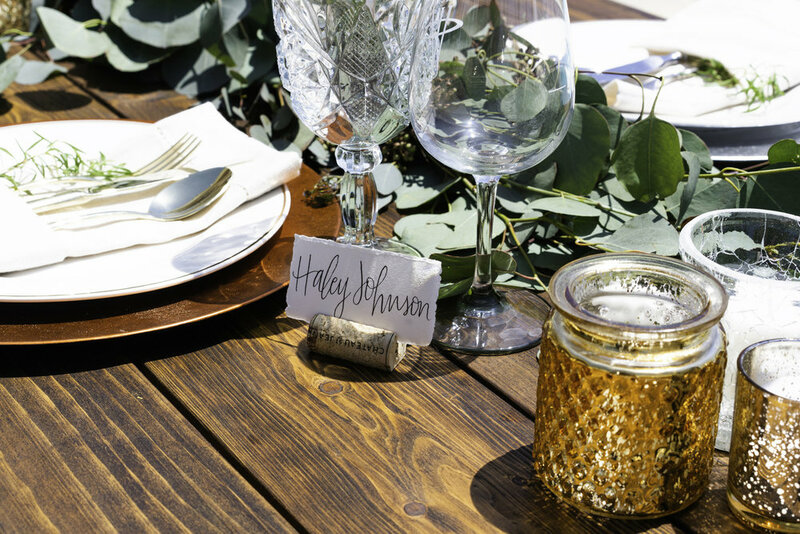 The venue boasts amazing views of the wine country and also has a dedicated helicopter pad on site to offer guests private tours! 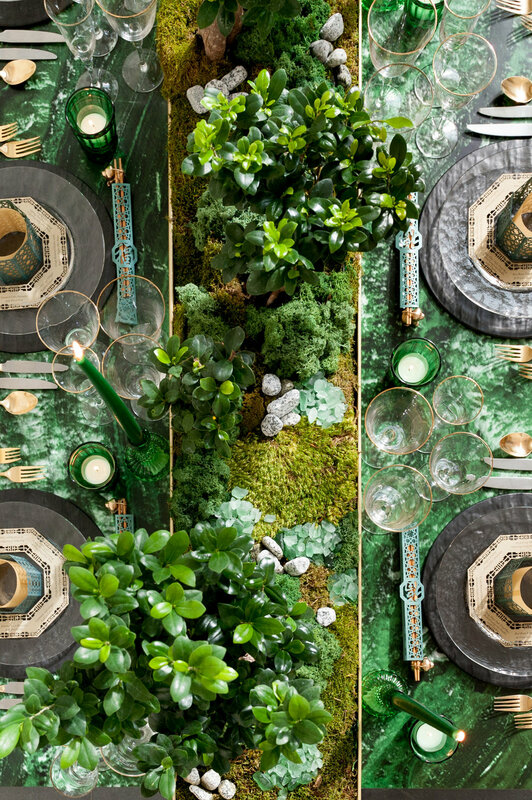 The muted hues of bronze, gold, silver, copper, combined with plenty of greenery reflect the outdoor Southern California vibe and blend flawlessly into the rugged landscape extending into the distance. 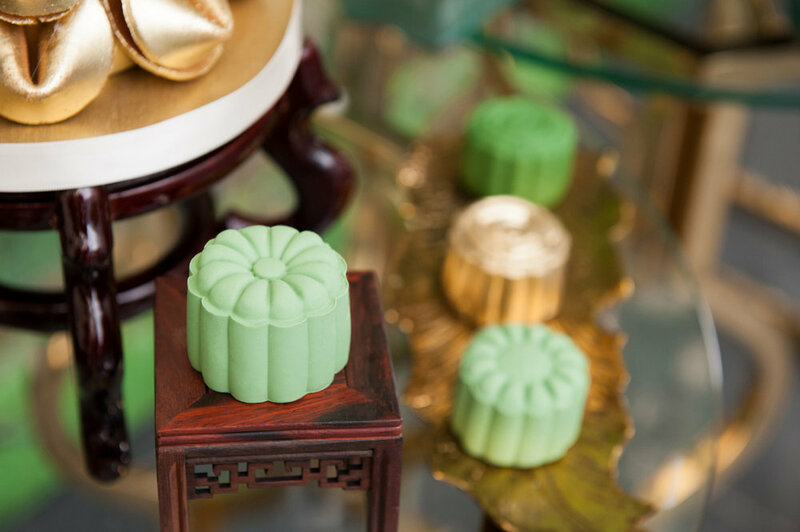 Overall, the scene conveys a simple purity that relaxes the senses. 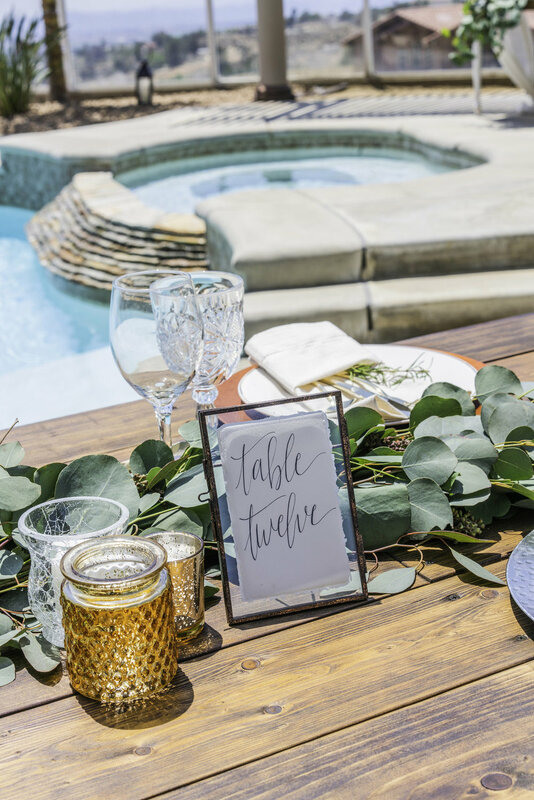 The handmade furniture such as the palette bar, the desert table with back drop, and the mismatched table settings lend a custom DIY element to the theme. 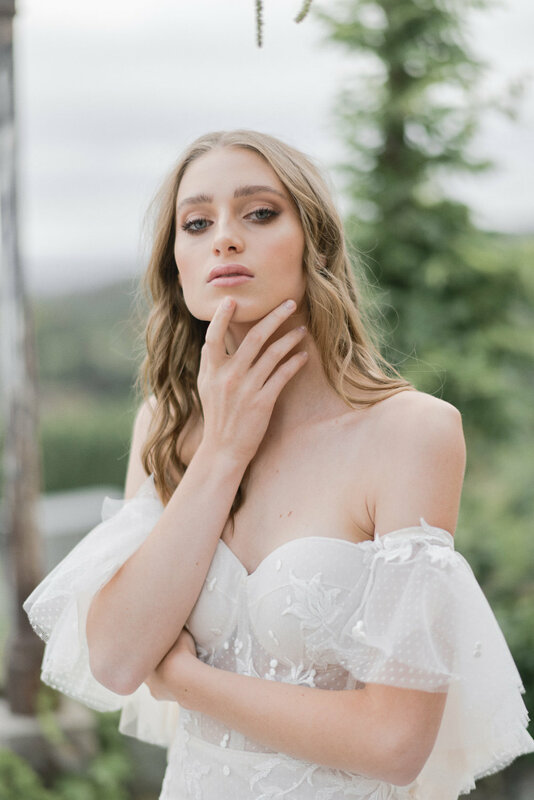 The beauty of the scenes, the models, the make-up, the hair, and the dresses were expertly captured and edited by a talented photographer from Monterey. 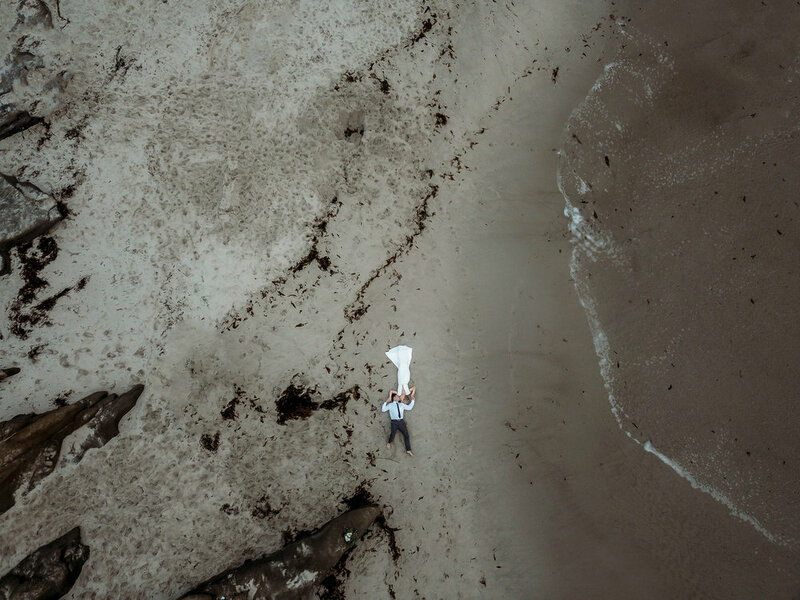 The videographer from Los Angeles worked alongside providing both drone and handheld coverage that documented the full process. 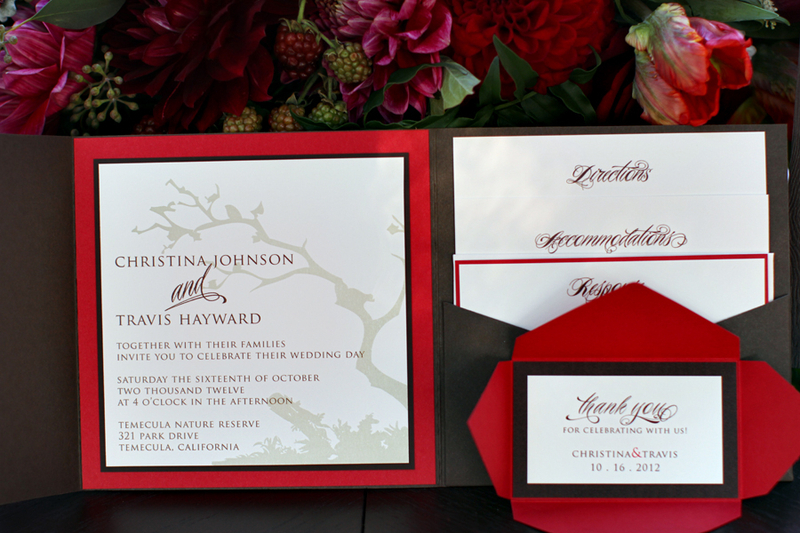 This was a truly collaborative effort that brought talented vendors from across California. 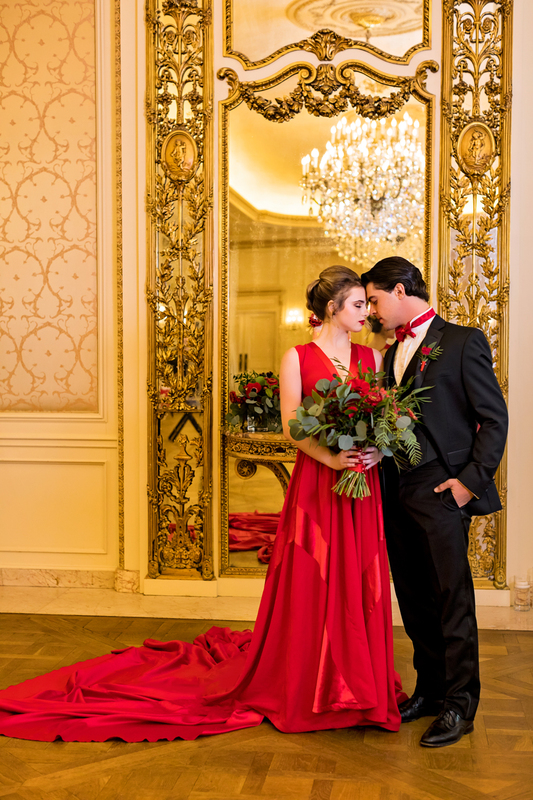 It turned out to be much bigger than originally intended and consisted of a full crew included: photographer, videographer with drone, models, couture bridal designer, makeup and hair, florist, catering, calligraphy, accessories, rentals, and graphic design. Behind the scenes, the chemistry between the models and the crew added to the energetic and fun vibe on set! 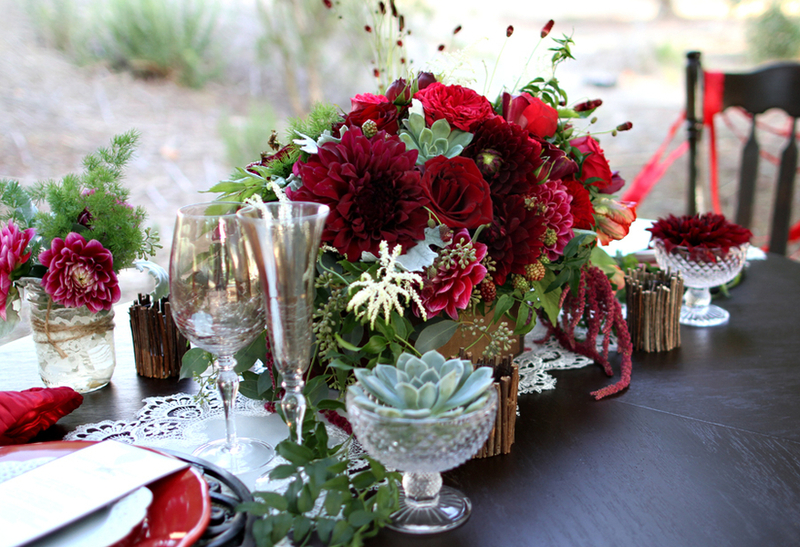 Romantic Winter Wedding Styled Shoot in Our Fave Little Mountain Town Outside San Diego; Julian! 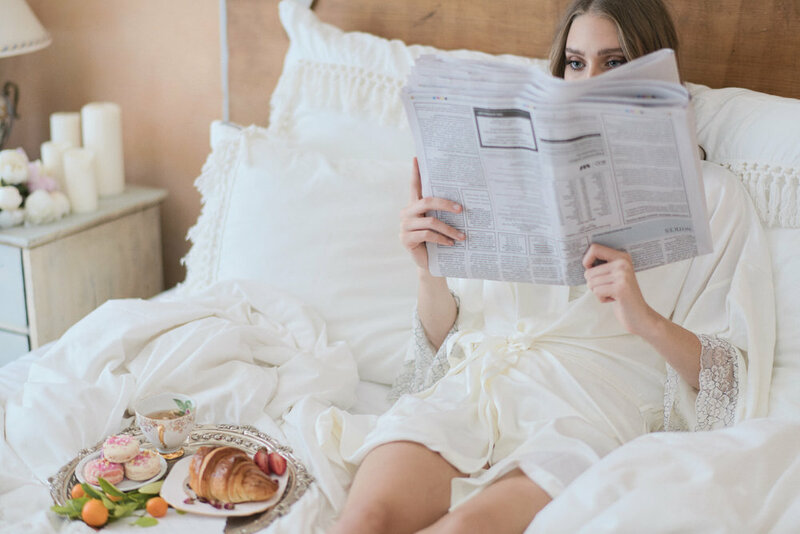 Nestled away in the mountains of Southern California is the cozy little country town of Julian. 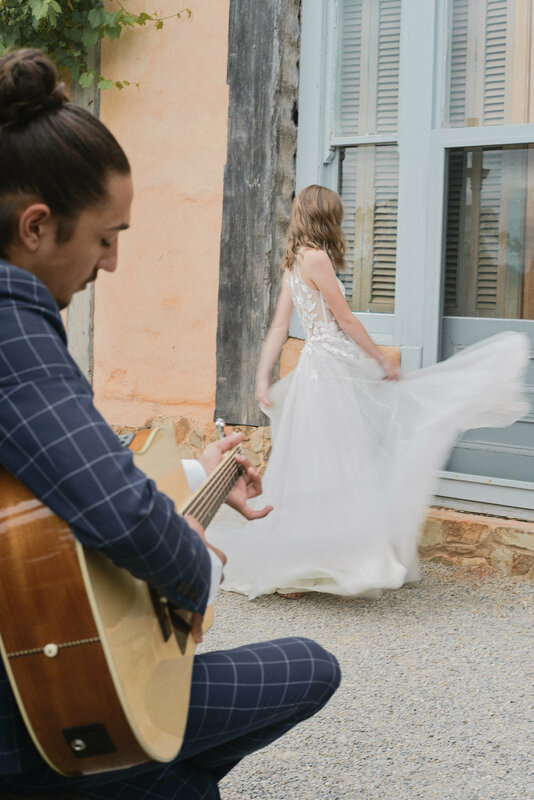 Sacred Mountain Julian is the perfect venue for nuptials at any time of year, but it will truly steal your heart as the perfect setting for a Wintry themed, mountain wedding, with, of course a gorgeous couple and a beautiful Black Beauty horse model! 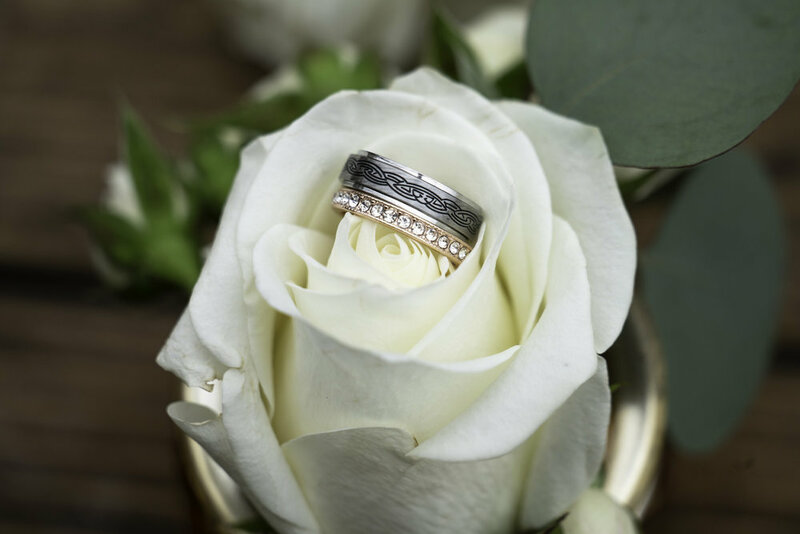 Lesli and Spencer, have been married for six years, but took advantage of this opportunity to relive their newlywed days and remember exactly what it was like when they first said "I do". 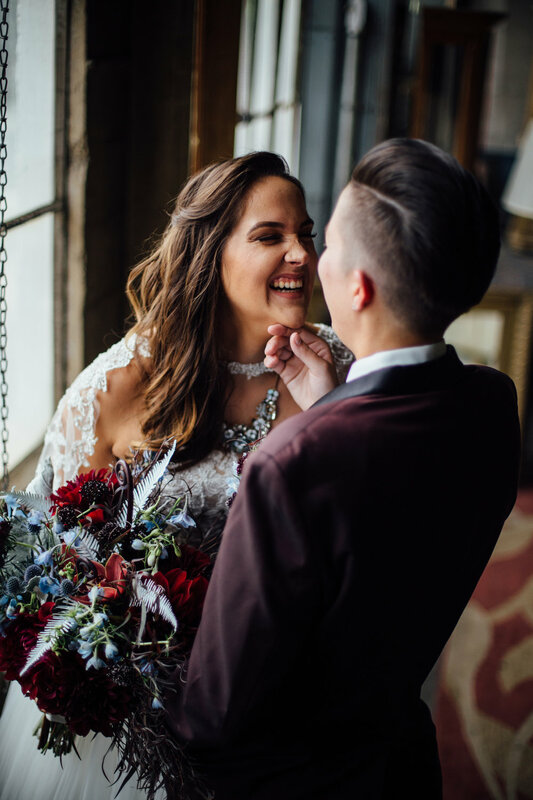 Being that Spencer serves in the US Marine Corps, photographer Katie Hammond couldn't think of a more deserving couple to feature in her styled wedding shoot. 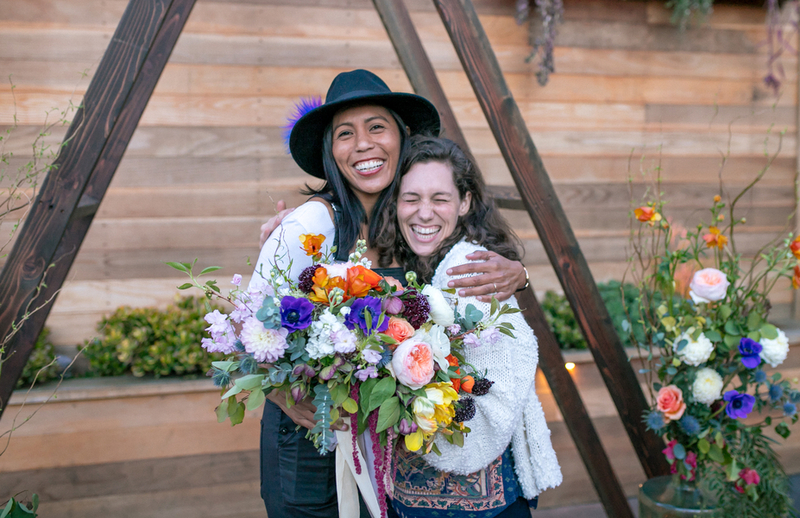 It's lovely to see the love and fire are alive and well (and going strong!) after six years of marriage! 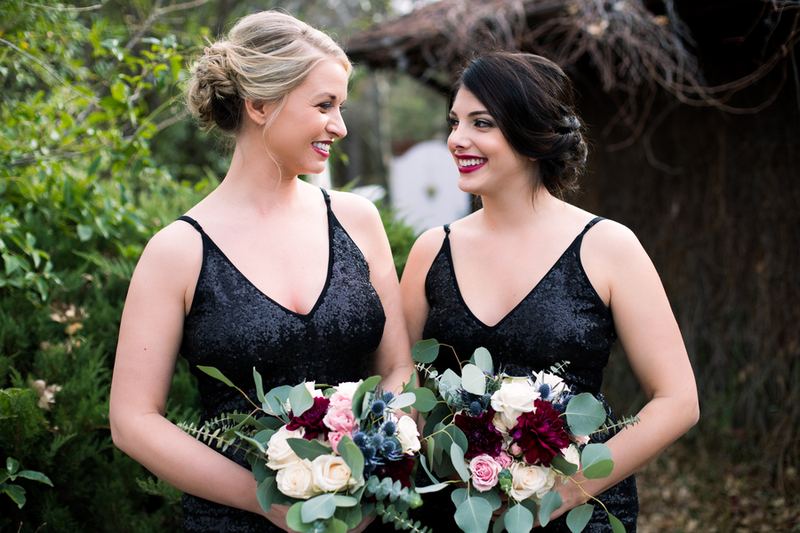 Drenched in rich tones of burgundy and gold, my shoot featured stunning details like two pairs of Badgley Mischka heels dripping in jewels, vast views of mountains and fields, gorgeous black horses, and black bridesmaid dresses (and they TOTALLY pulled it off!). 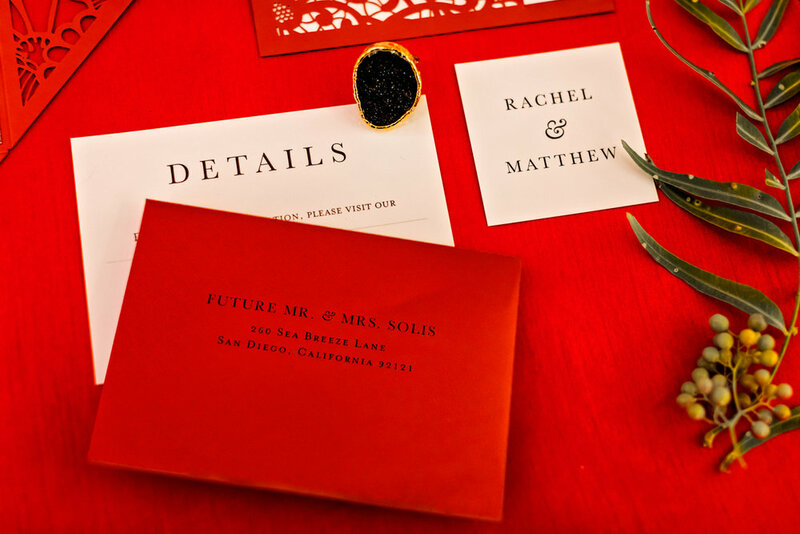 Holy Matrimony Batman! 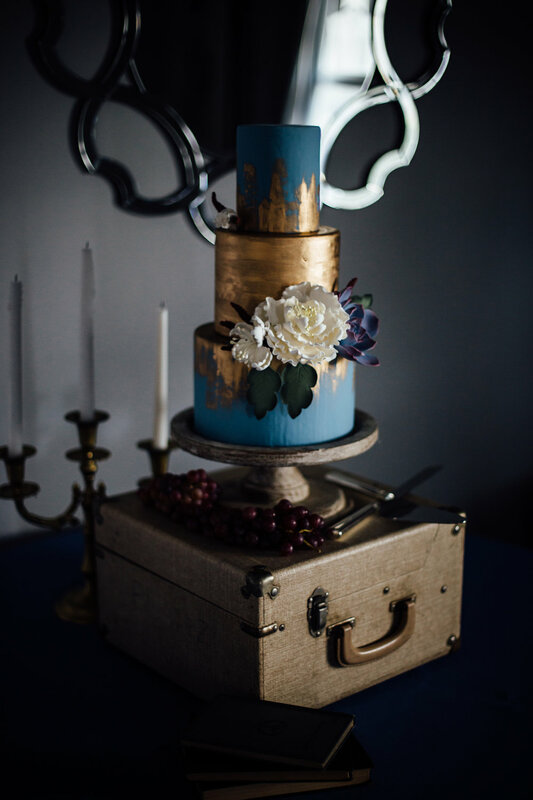 It's a Gotham Themed Wedding Styled Photo Shoot! As home to Comic Con, San Diego knows a little something about super heroes and cosplay! 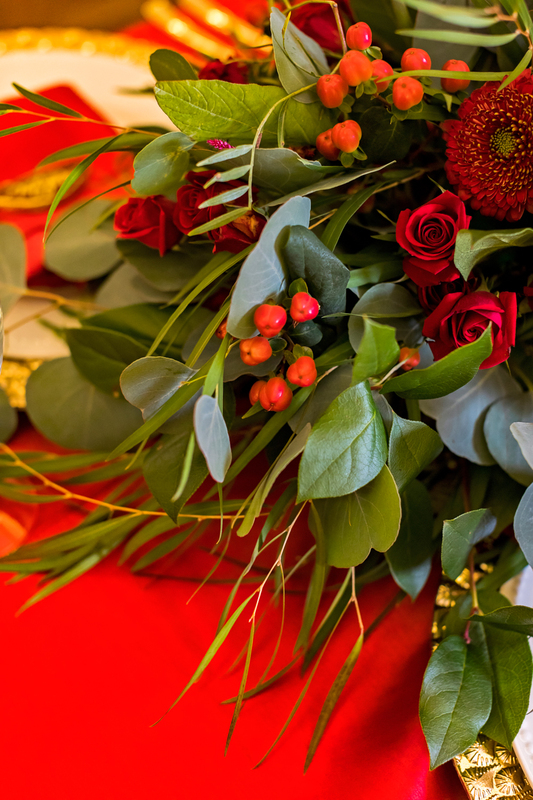 And let's face it wether serious or fantasy, Wedding Styled Shoots are all about playing with creativity and ideas. So Batman meet Catwoman in a dark and moody styled shoot that celebrates Bruce Wayne and Selina Kyle in all their alter [or should we say altar!] egos! 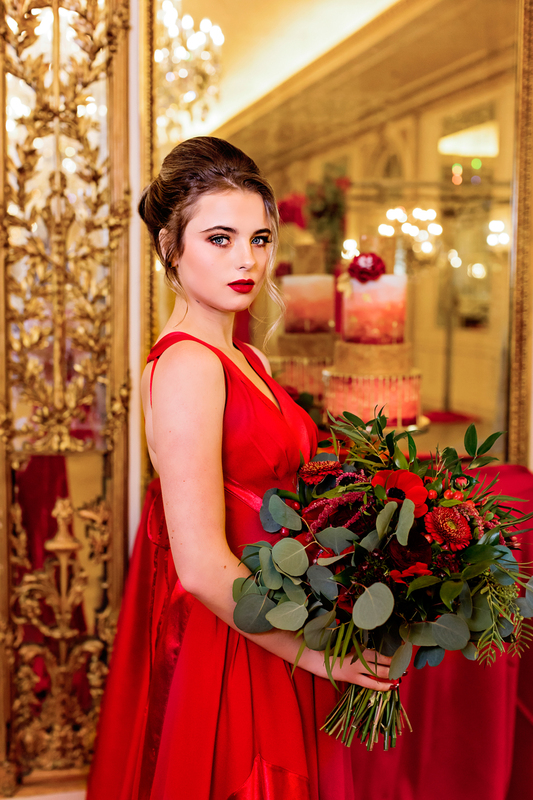 We hope you enjoy this carefully thought out, and very playful, photo shoot, which shows beautiful photography, staging, lighting, florals, invitations and really great hair and makeup, all styled to celebrate Gotham! Gotham is a dark, mysterious, scary, and moody place. Although there is a lot of crime, there are also those characters that make a difference for the betterment of the city. Enter Batman. Batman is well known to keep the streets clean of crooks. He is like Gotham´s protector. But, who protects Batman? Enter Catwoman. At first these two were rivals. Catwoman was a villain and was known as a thief that prowled the night while Batman is a superhero that prowls the night. These two have had their differences but their love for each other grew immensely after many bad and good encounters. They are connected by their similar tragic backgrounds and by their love for their city of Gotham. They are intertwined as Bruce Wayne and Selina Kyle. The Story Setting: They decided to get away from Gotham for their wedding and only invited close friends and family. 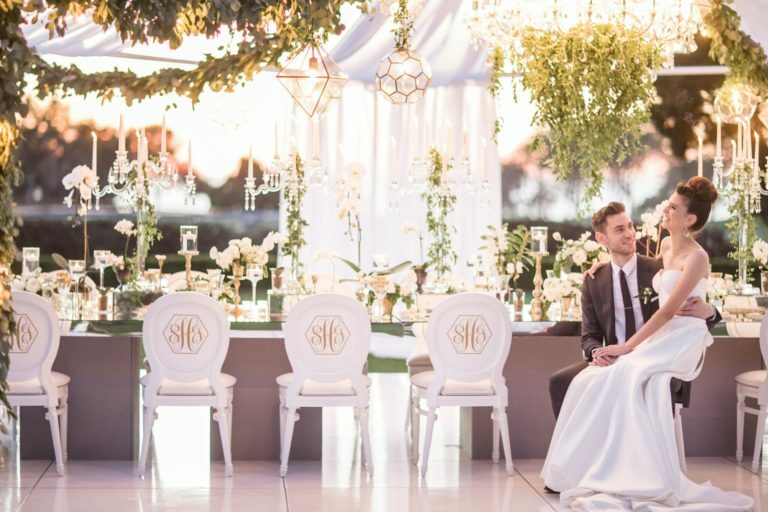 A small beach town was perfect for them as long as it included a gothic church to marry in and a reception venue that resembled Bruce Wayne´s mansion. The ceremony took place in the evening as it is what Batman and Catwoman would do. They are night prowlers, after all! 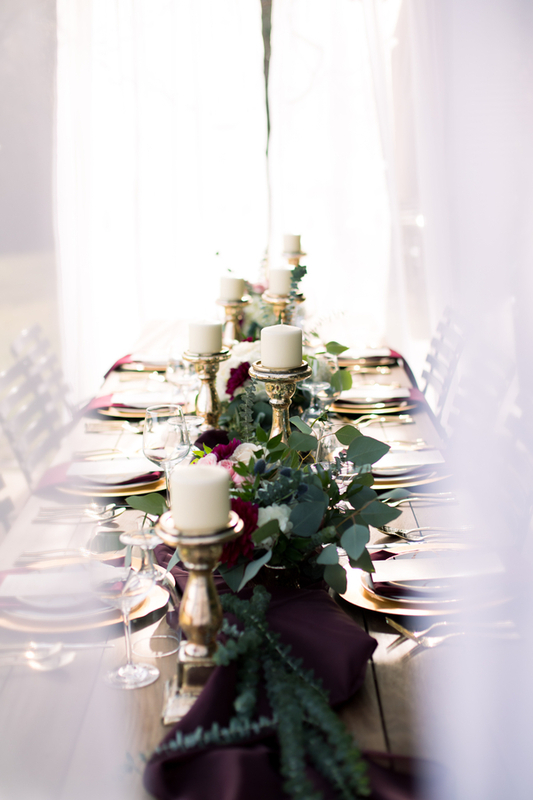 The reception venue was small but perfect for their intimate wedding. 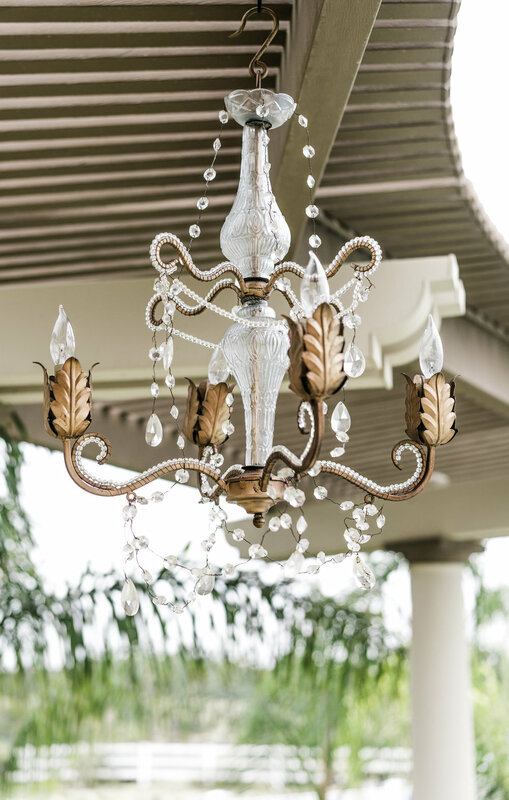 Its many furniture pieces resembled the ones in Bruce´s mansion from the grand piano to the bookcase to the curtains and to the paintings on the wall. 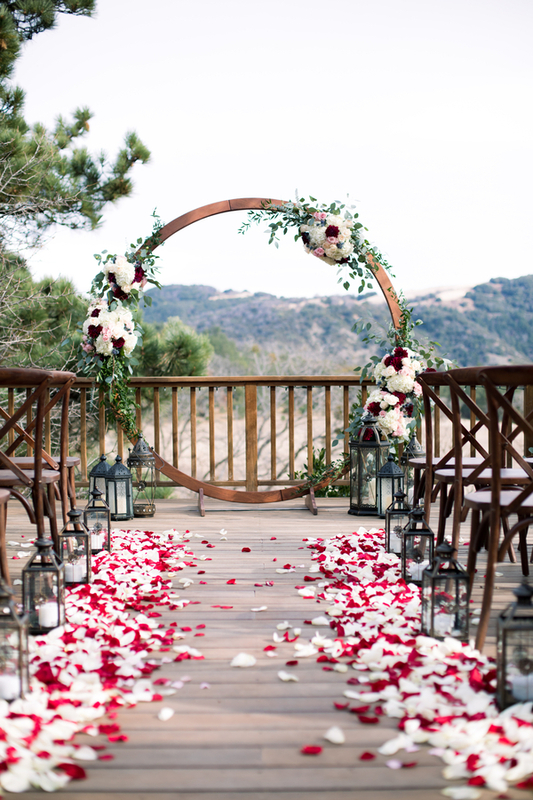 When you stepped inside you felt like you were in his mansion and that is why Bruce and Selina chose this venue, Gatherings in Pacific Grove. Batman and Catwoman's "First Look" photos took place on the water near the ceremony and reception sites and inside the reception venue itself. 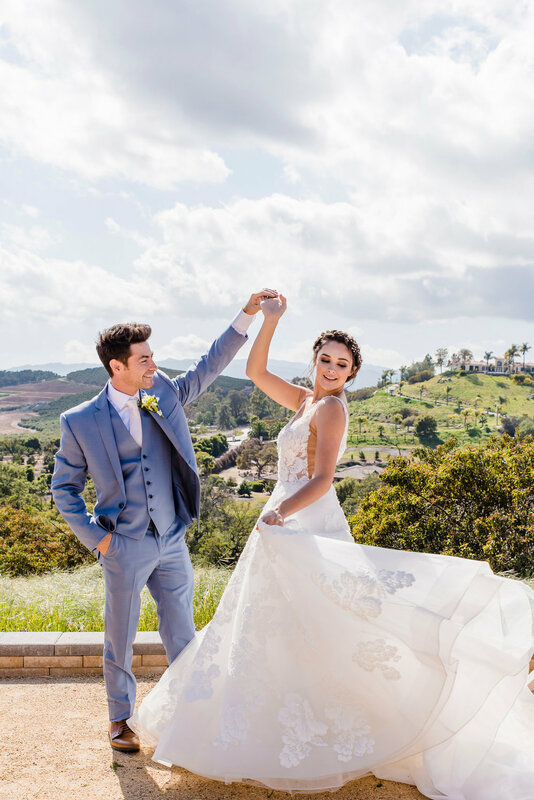 Usually First Look means that the bride and groom see each other in their wedding attire before the ceremony but they changed things up! They still wanted to keep their attire a surprise so they took photos in their usual Batman and Catwoman disguises. The chemistry between these two are apparent as they took photos at the reception venue and near the beach. And who better to invite than their superhero and Gotham family. The entire Justice League were among the guests in attendance and this included Clark Kent and Diana Prince. Of course, Commissioner Jim Gordon and, Bruce´s butler and father figure, Alfred Pennyworth were in attendance as well. 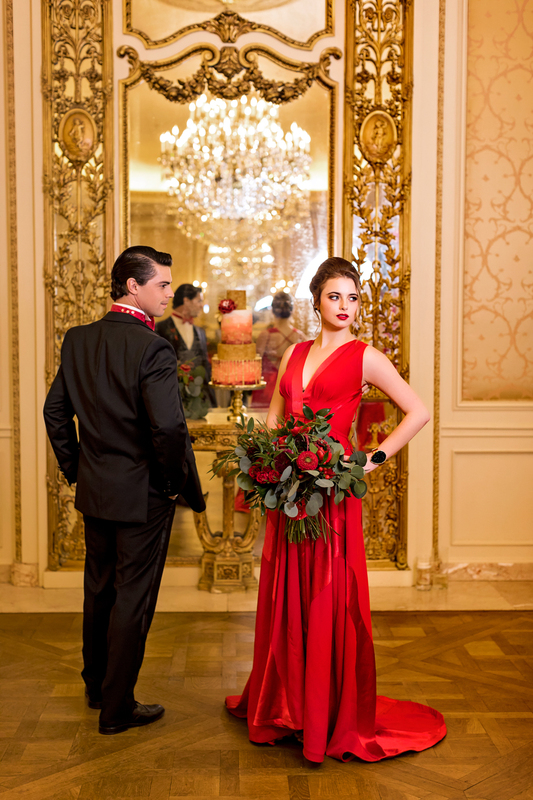 The Music: Amy Hung Films created an amazing video for this unique styled wedding shoot. The music “Apex" by Kevin Graham fits in perfectly. It’s dark, dramatic, and mysterious yet romantic in a way that gives the audience a feeling of the intense love between Batman and Catwoman. 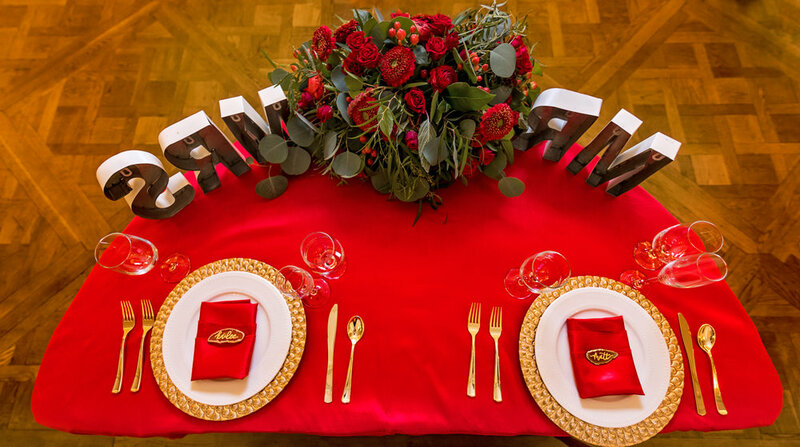 How You Can Mimic the Comic Books On Your Wedding Day! 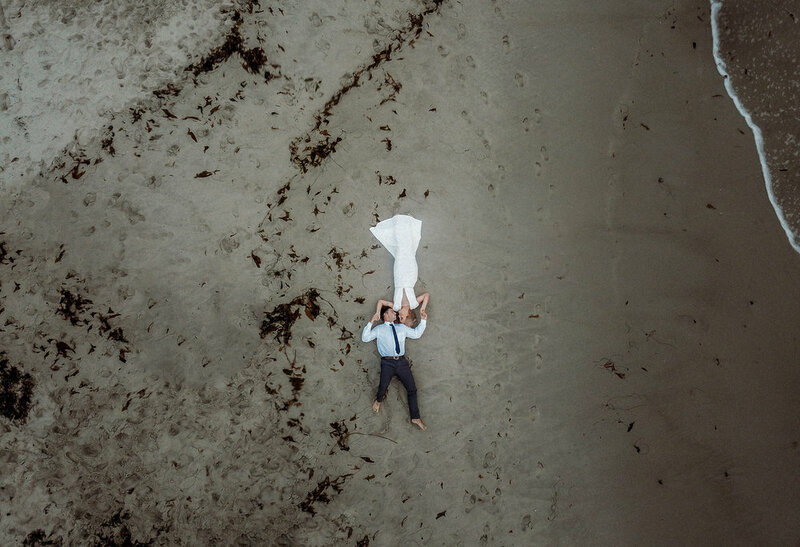 If you're a true fan of all things superhero and comic books and want to feel powerful on your wedding day, then you'll want to get behind this Small Beach Town Meets Gotham styled wedding shoot. The theme for this shoot was dark in color and moody in feeling, to keep true to the Batman and Catwoman personas, but has class for days as you will see in the design elements chosen. 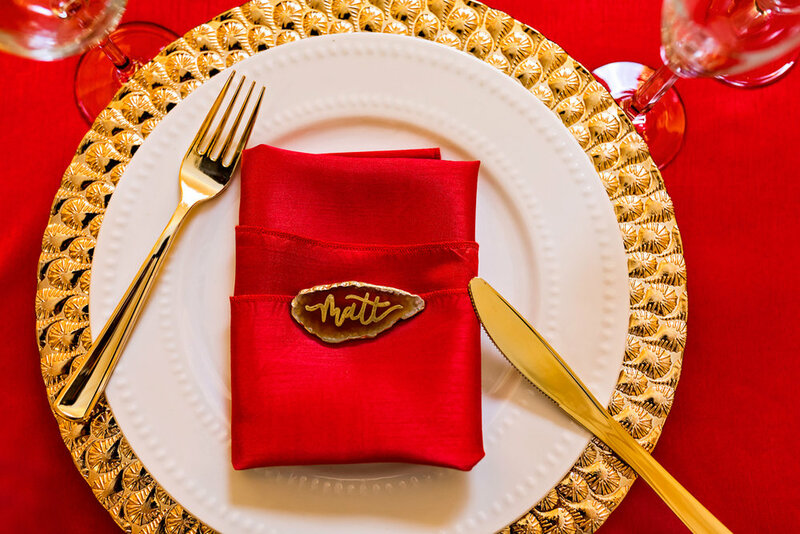 Although not all elements are for the DIY couple, there are fun ways to customize aspects of this comic book wedding. 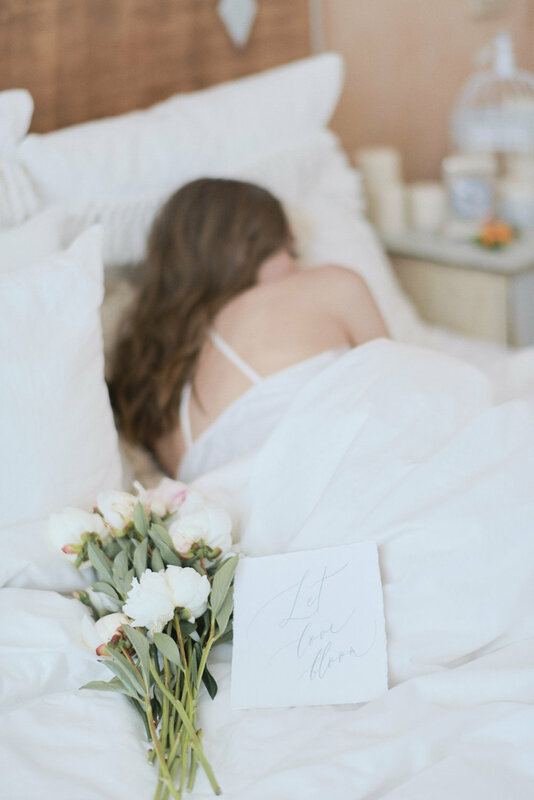 The vendors were also hand selected specifically to fit the style of this shoot since we believe it is so important to support fellow creatives to bring your design and vision to fruition. 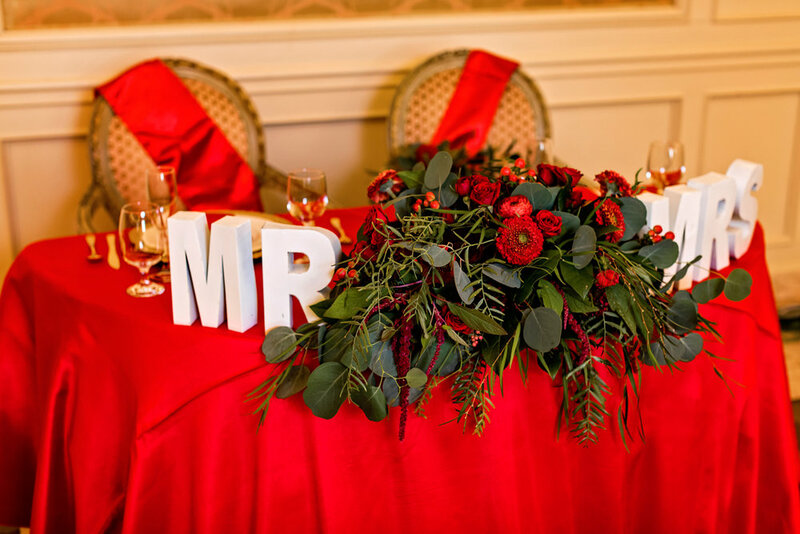 The elements for the shoot were carefully planned by Cristina Galvan of Hermosa Weddings and Events to keep true to the comic books Batman and Catwoman originated from. 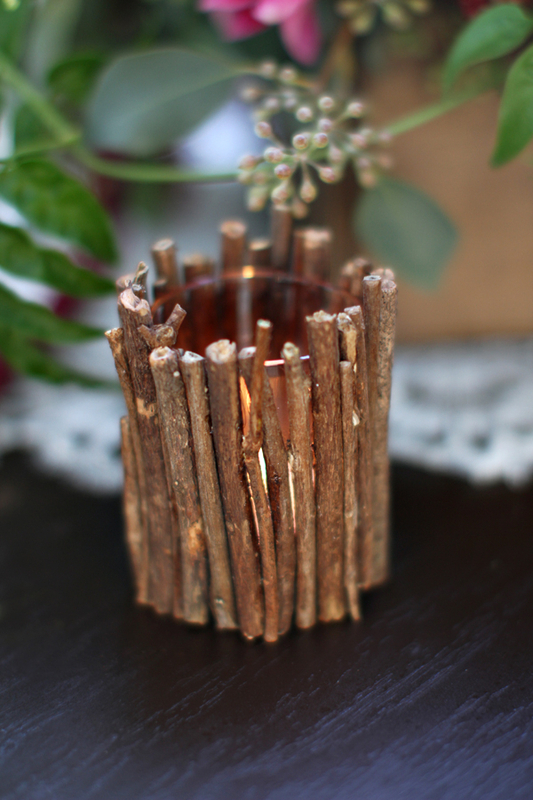 Many elements were DIY or easy to find at a low cost. Planning ahead and looking for deals at local stores and online is a must. From finding the Justice League figurines to finding the authentic Batman cape to finding the comic books to finding the Clark Kent glasses and to finding the large black frame for the DIY seating chart. Catwoman´s black mask is another DIY element that can be easily recreated by any DIY couple. Also, the Holy Matrimony! and Meowwww! 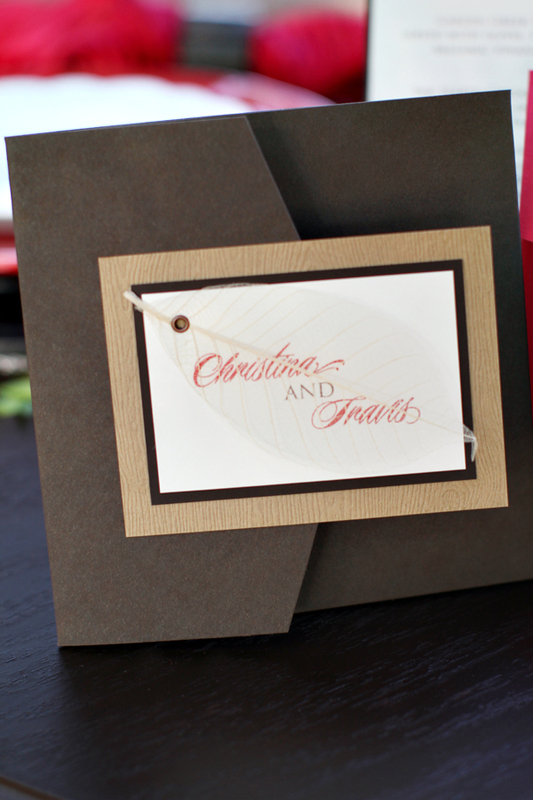 taglines were created using a printer and paper. 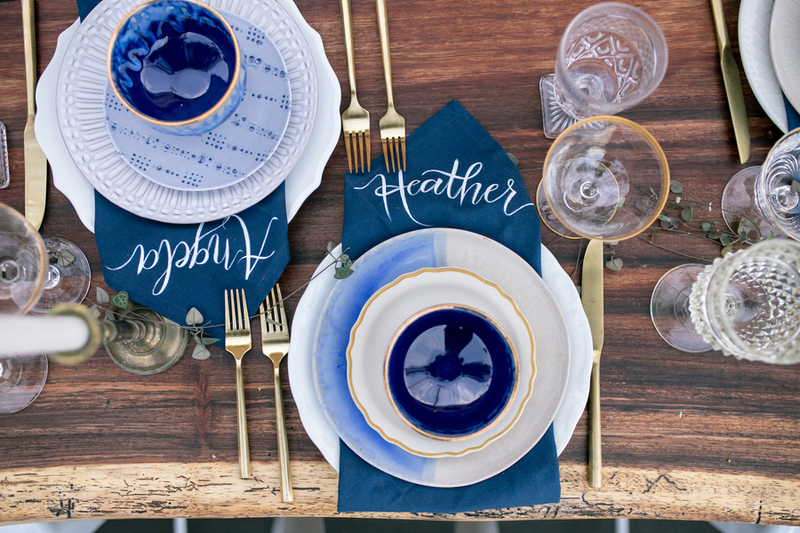 These and more low cost and DIY items were among the design elements that perfectly fit the theme. The black sequin dress was a showstopper and paired well with Catwoman´s accessories. 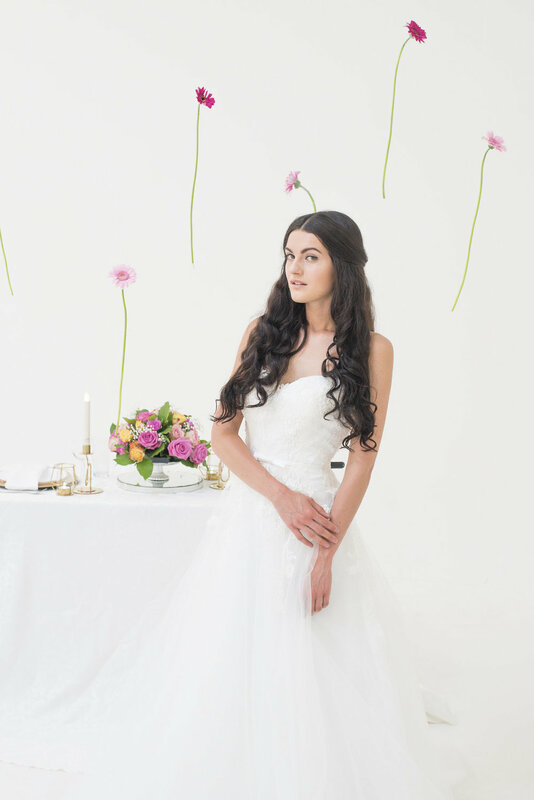 The dress is a design from the bridal shop, Collezione Fortuna Fashion Boutique and Bridals. Catwoman wouldn't be complete without her gold accessories and this is a great opportunity to get creative and find unique pieces at local thrift stores to fit the theme. 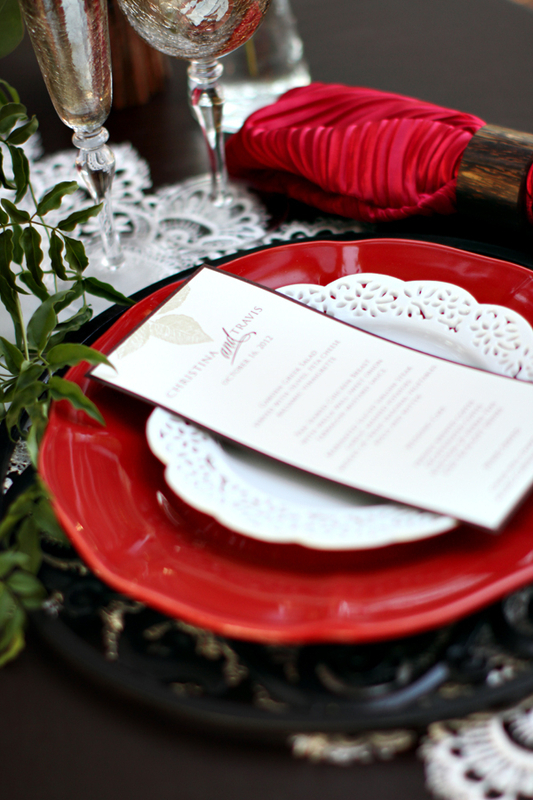 Hermosa Weddings and Events opted for black linens. 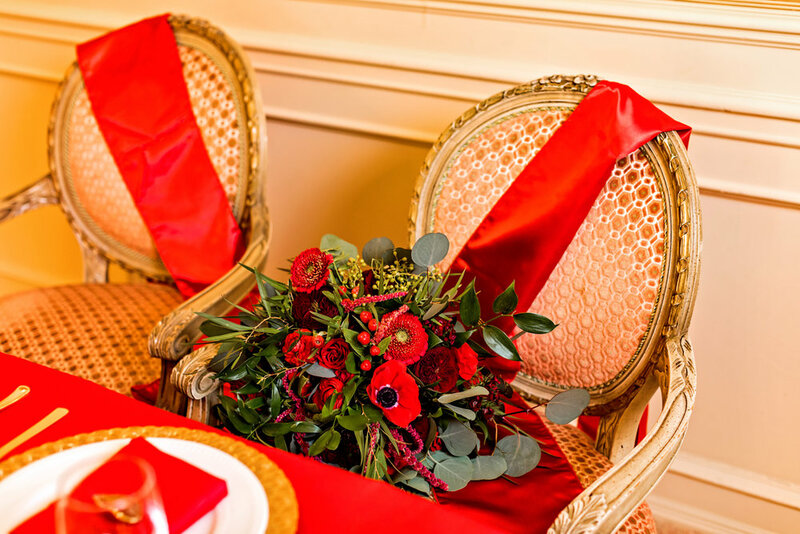 They were used at the reception to create a dark and moody feeling to this comic book affair. 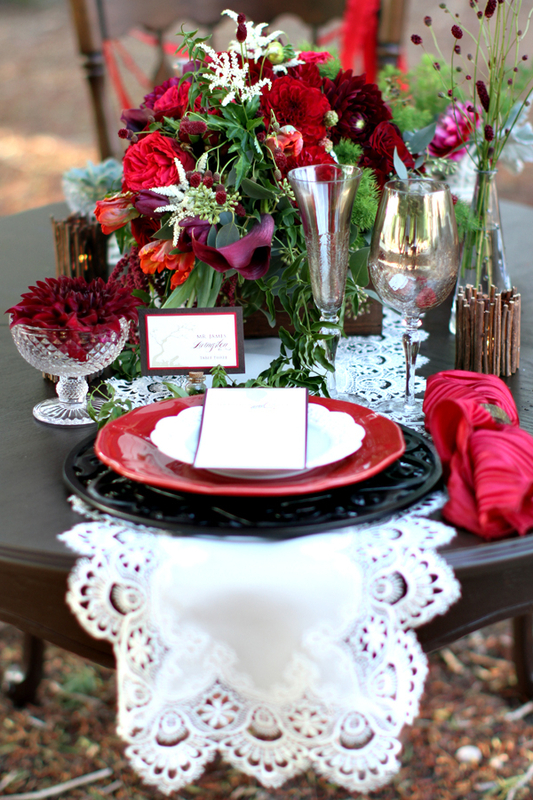 To spice it up, you can incorporate specialty linens such as black sequin linens as seen on the reception table. 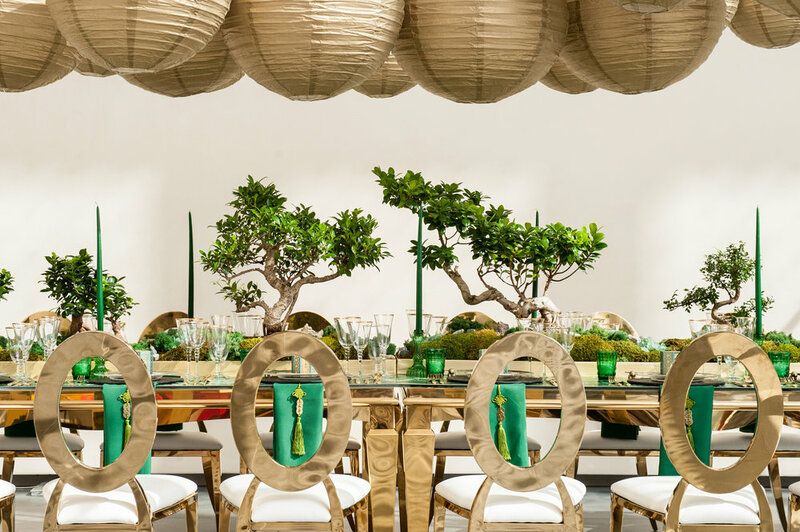 This is where a specialty linen company like Party Crush Studio can come in. 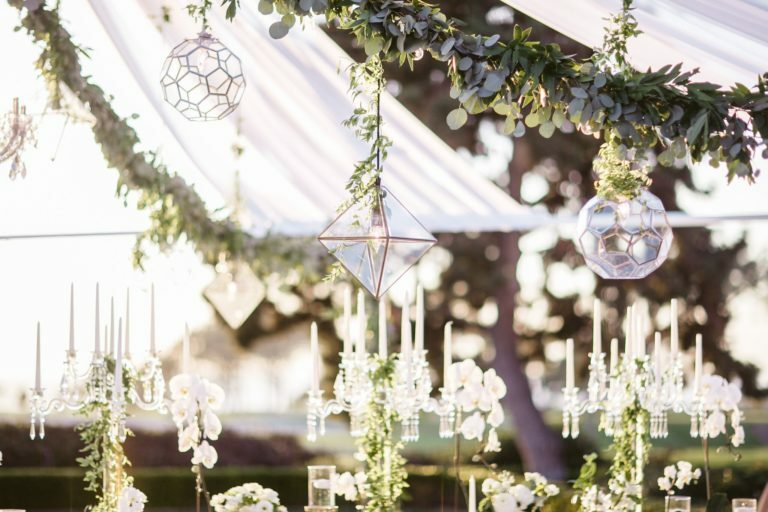 Lot 8 is new venue for weddings and events that we absolutely adore! It has tons of potential for upcoming years. 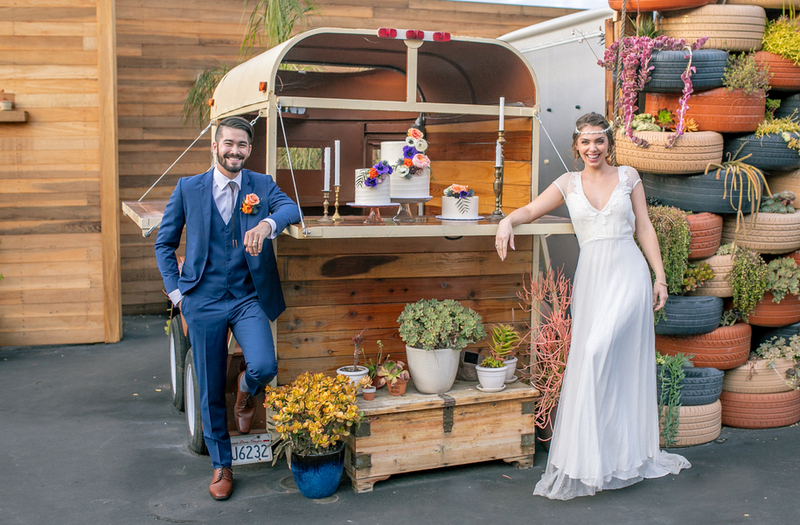 Christophe Willm of Willmus Weddings Photography brought an exciting and fresh creative team together and took over the space with lots of bright colors and wood accents and the coolest repurposed horse-trailer-turned-bar we've ever seen; the "Pony Bar"! SWF seeks Wolf for Marriage and Lifelong Love. 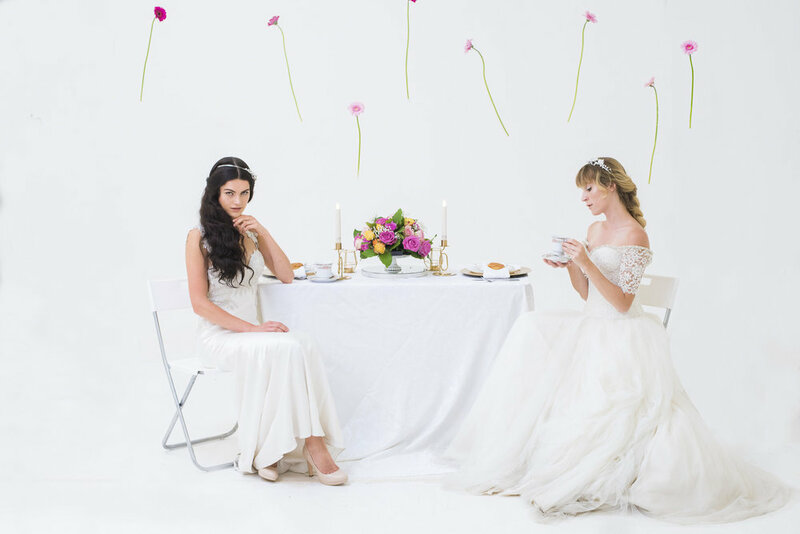 We all love a fairytale wedding styled shoot! And obvious Red Riding Hood elements peppered the styling and couture in Game of Thrones costumes! Velvet capes anyone? 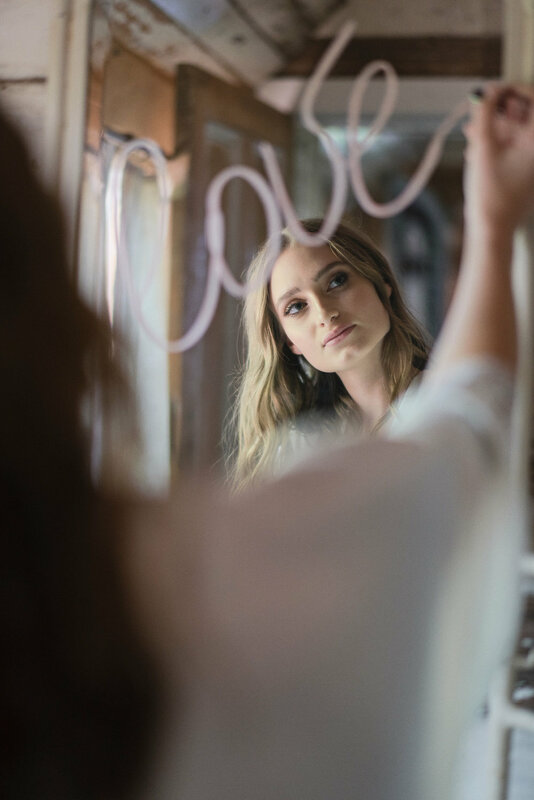 Fairy tales have become more and more au currant in our culture and we think these timeless themes always resonate with fashion shoots. 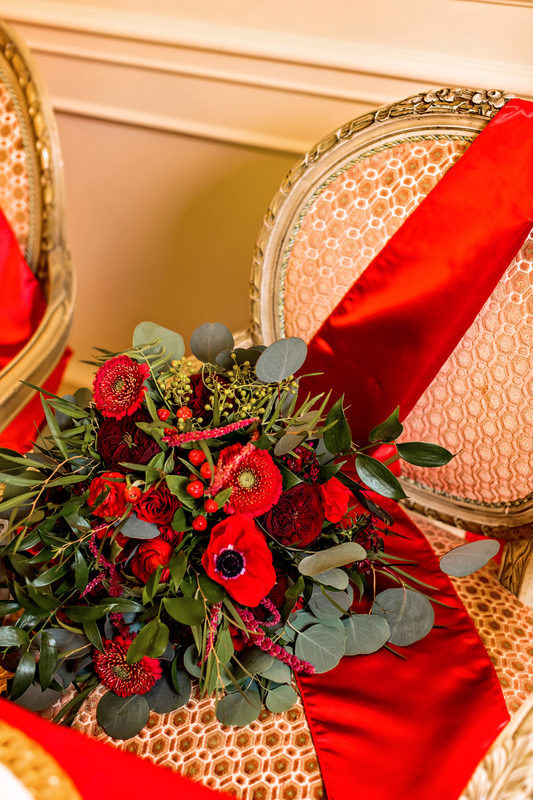 Oh and we do love red! 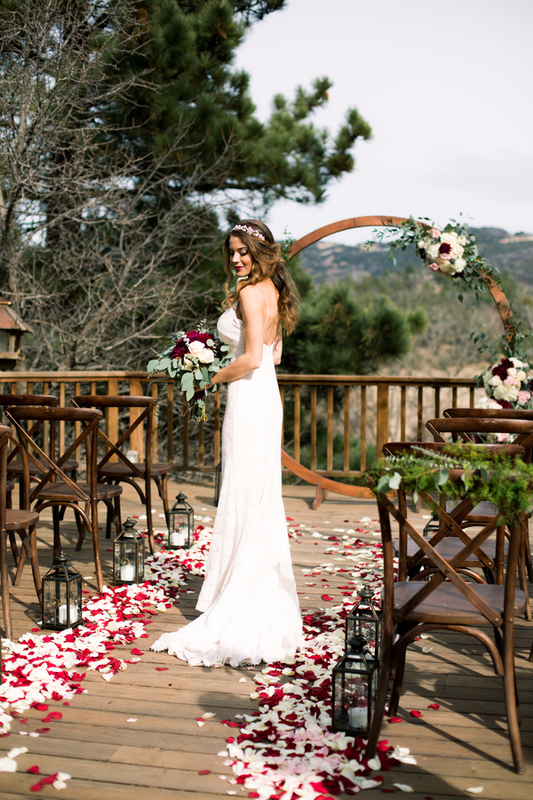 The vintage Diamond Chantilly lace wedding gown by Hope Stanley was boldly embellished by a Jim Hjelm sash. 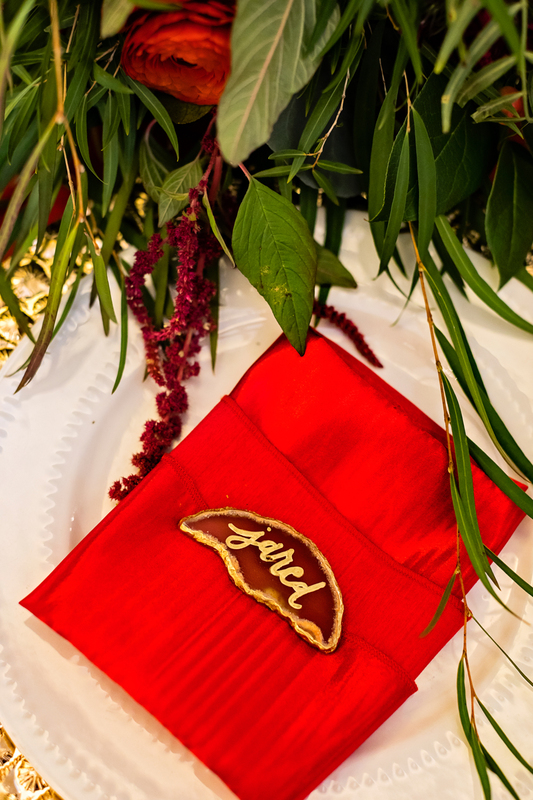 The broach and tiara were vintage as well. 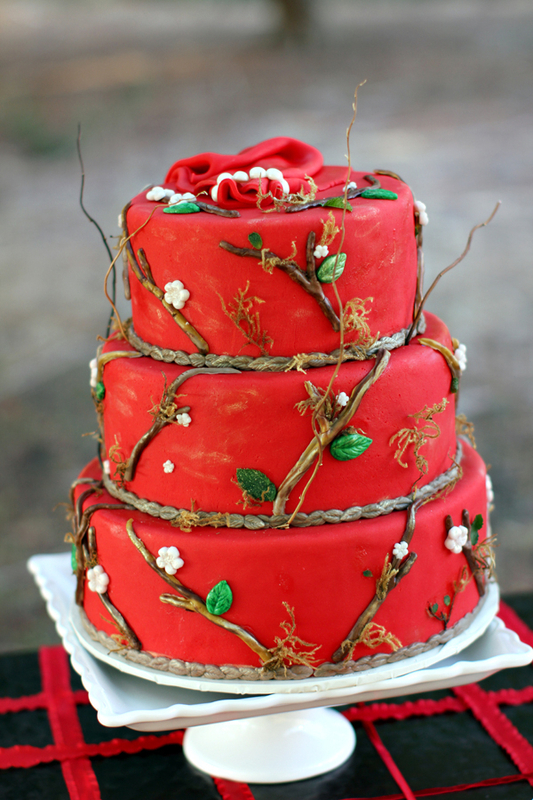 The cake designer provided a 3-tier red cake which used fondant to create the cake detail. 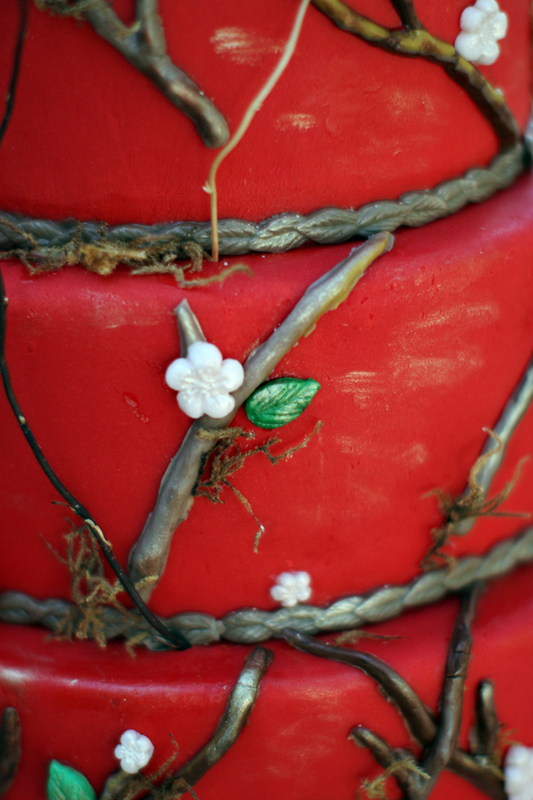 Branch and flower accents were created by hand, and the cake also featured twig embellishments. 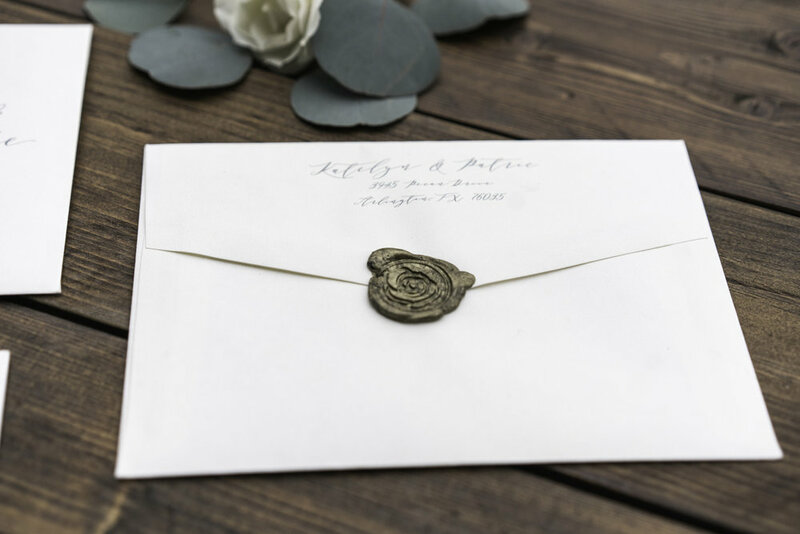 From the invitation designer: “I wanted to do something rustic to reflect the setting and theme of the wedding, while still keeping it elegant and contemporary. 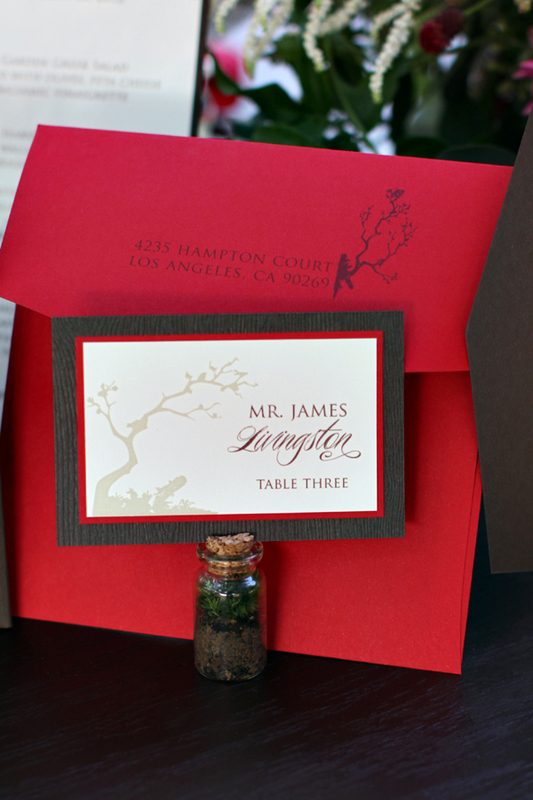 I didn’t want the red to “take over” the invitations, but rather be just an accented pop of color on the different pieces. 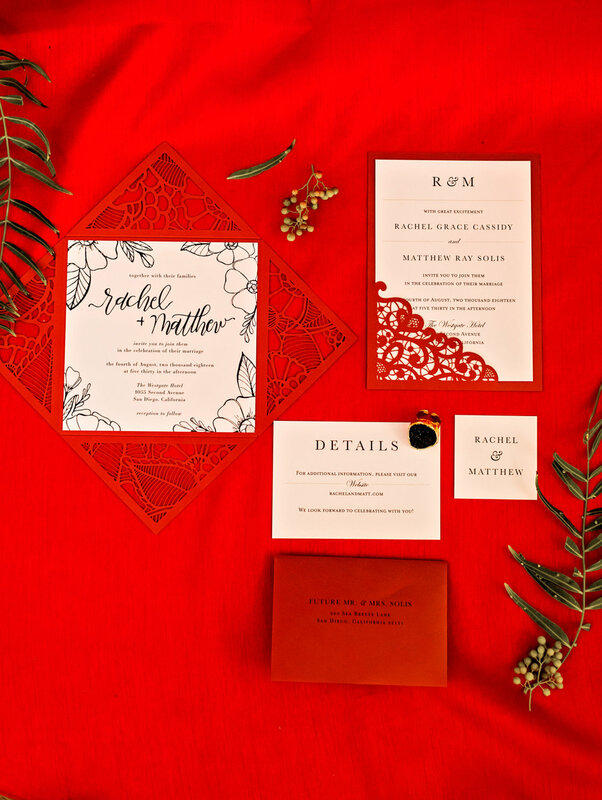 I used all matte cardstocks…but a combination of wood grain, smooth stock and textured stock to add some depth and dimension to the invitations as well." 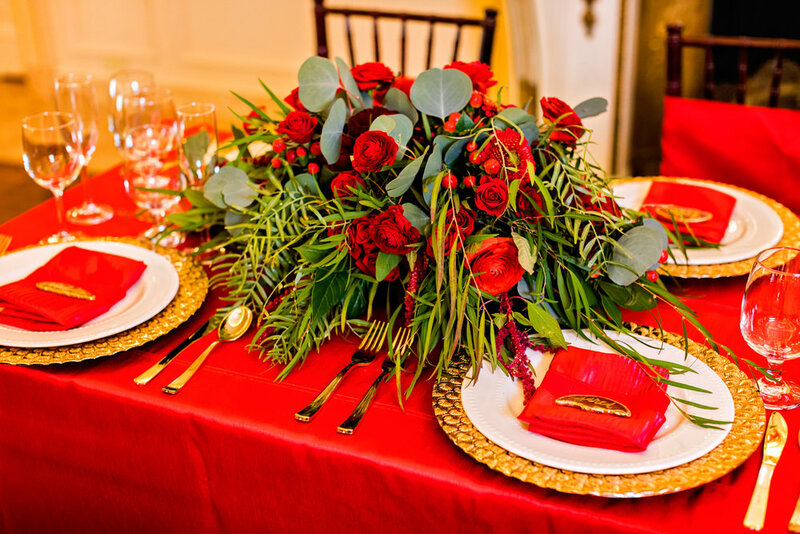 From floral designer Florals by Jenny: “I was inspired by the theme to use deep red lush flowers with a lot of textures and almost a velvet-like look. 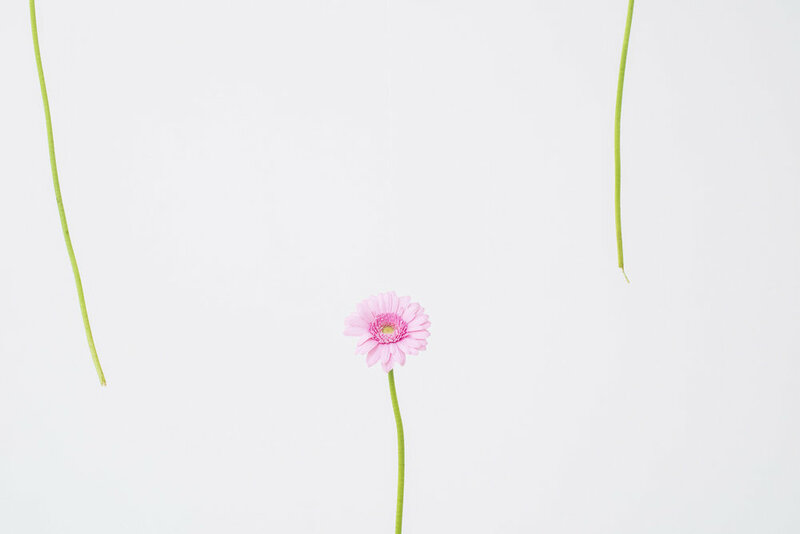 When picking out the flowers, I was also looking for various foliages that would have a natural wildflower feel that looked like they grew in the forest…that’s why I even incorporated some real blackberry vines. 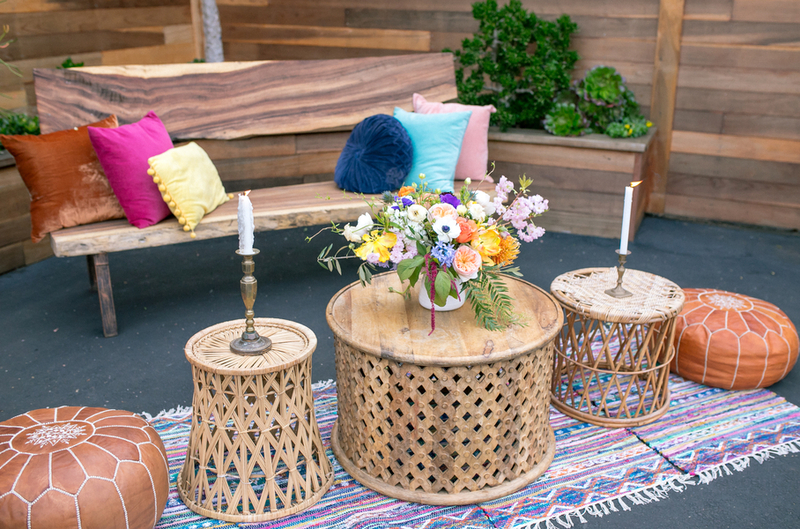 I also added about 6 other foliages and vines to give it a natural, rustic, garden-like feel.” Says Photographer Courtney McManaway, "this shoot was a lot of fun and so much credit goes to the great team of vendors!" Alpacas!! 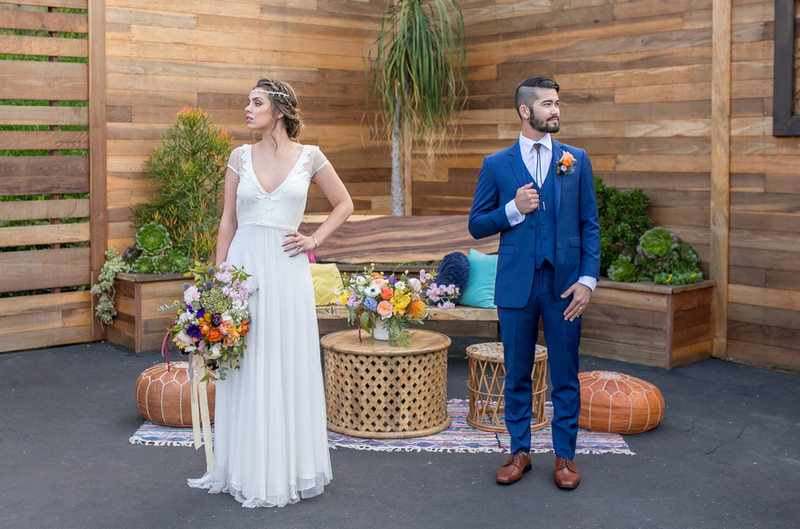 This adorable, alpaca-filled, wedding shoot is a new favorite [sorry dogs in weddings!] and was shot on an alpaca farm… need we say more? 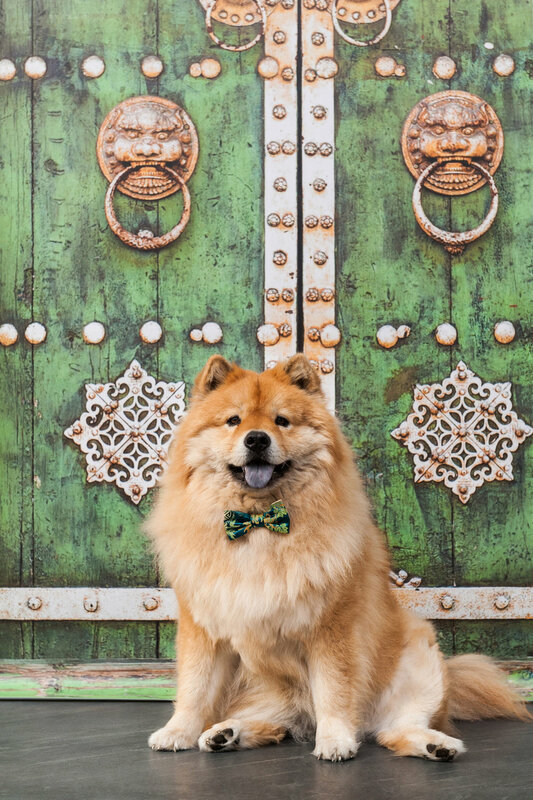 These fluffy, adorable creatures make their appearance next to the bride and groom throughout the entire shoot and we just can’t get enough. 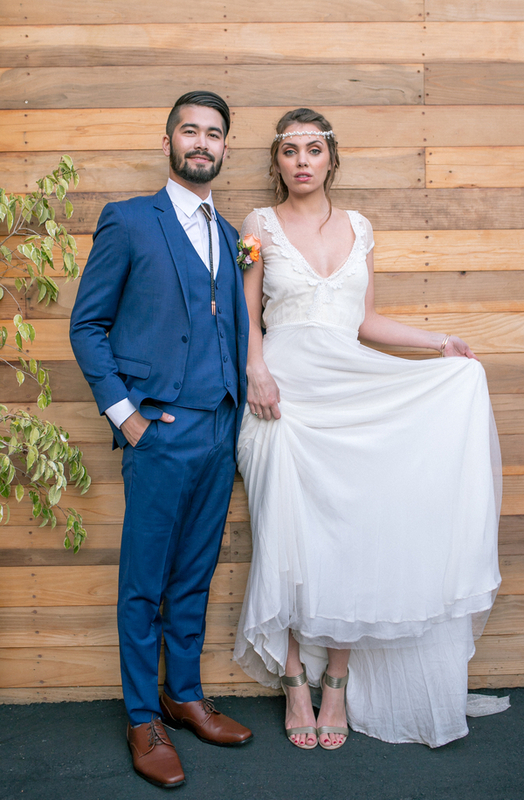 For those brides and grooms looking for unique, unconventional wedding ideas for their big day then an alpaca farm wedding might just be for you. 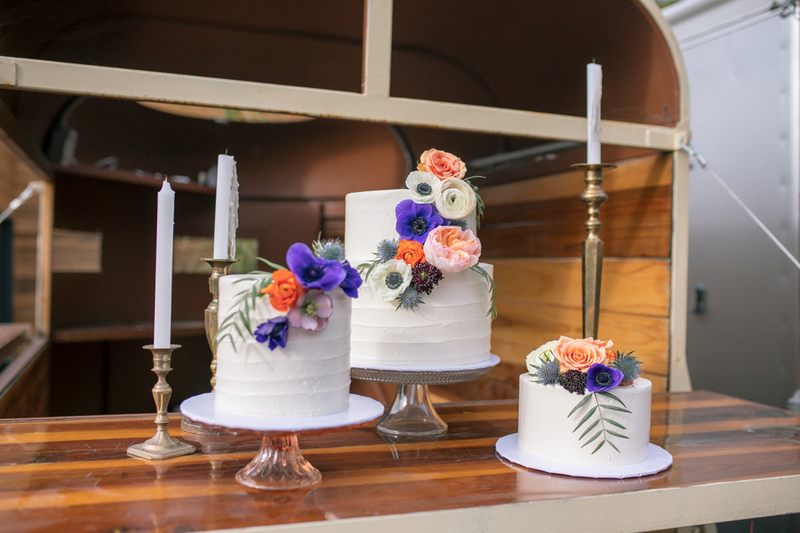 This shoot incorporated some amazing rustic decor with a wood table, bright pink florals and some fun orange pillow decor on the white chairs that added great color and some stylish [naturally] wedding cakes by Sweet Cheeks Baking Co.. 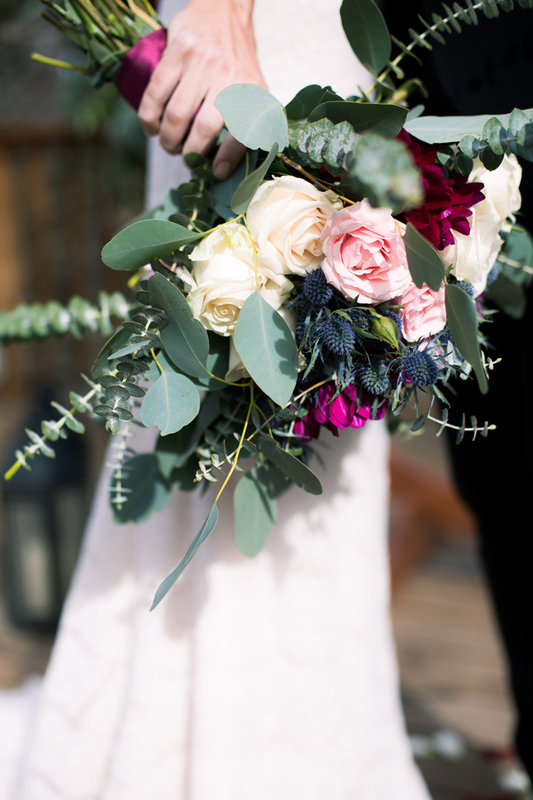 Enjoy these huggable alpacas and all the bright happy colors that foreshadow Spring's imminent arrival, all in this super fun wedding shoot below! 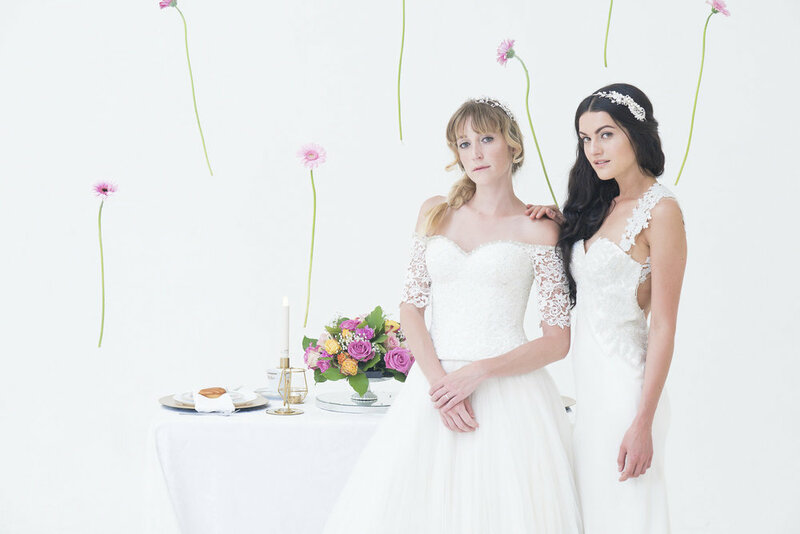 The bride wore a simple but beautiful a line wedding gown with a lace bodice and chiffon style. 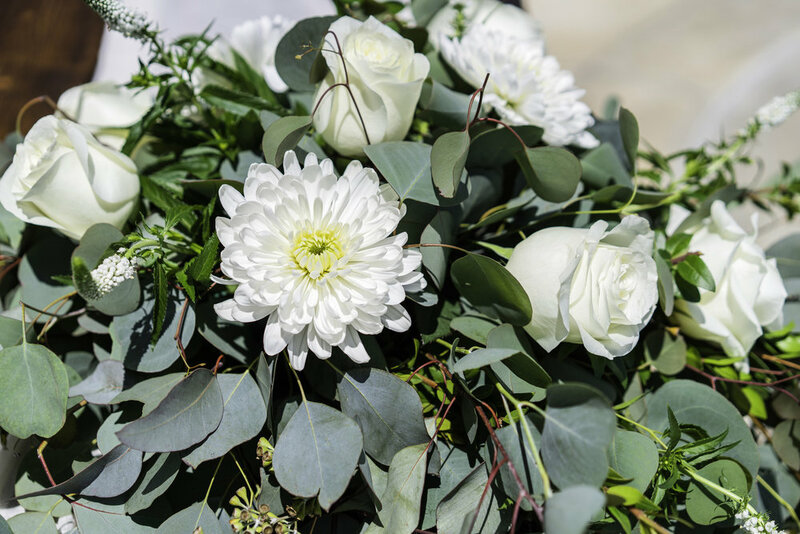 This look works for any wedding style or theme and never goes out of style, perfect for the brides who love their simplicity. 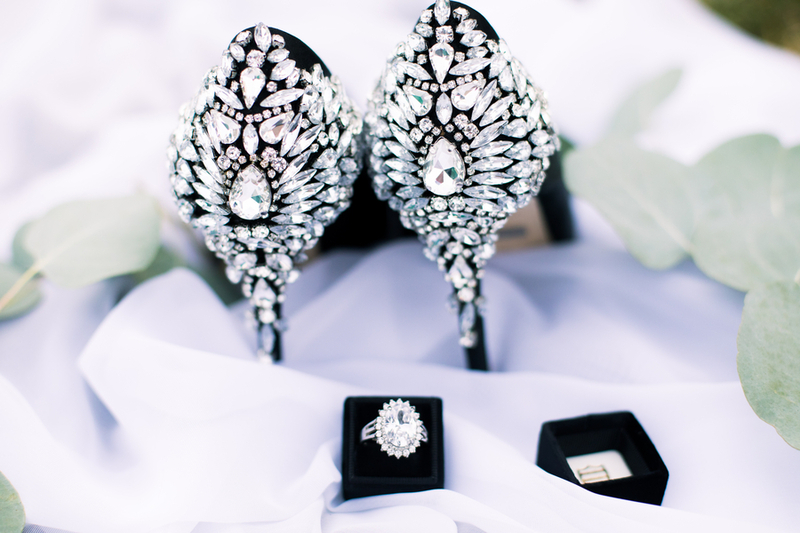 The bride also added some personal, rustic touch with some cowboy boots under her dress. 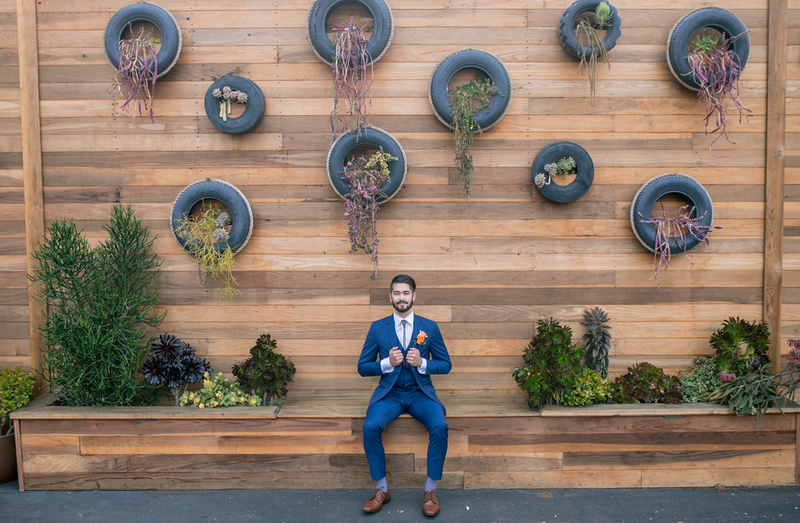 The groom is rocking our navy notch lapel suit with no tie and the top button of his dress shirt open for a more casual ensemble. 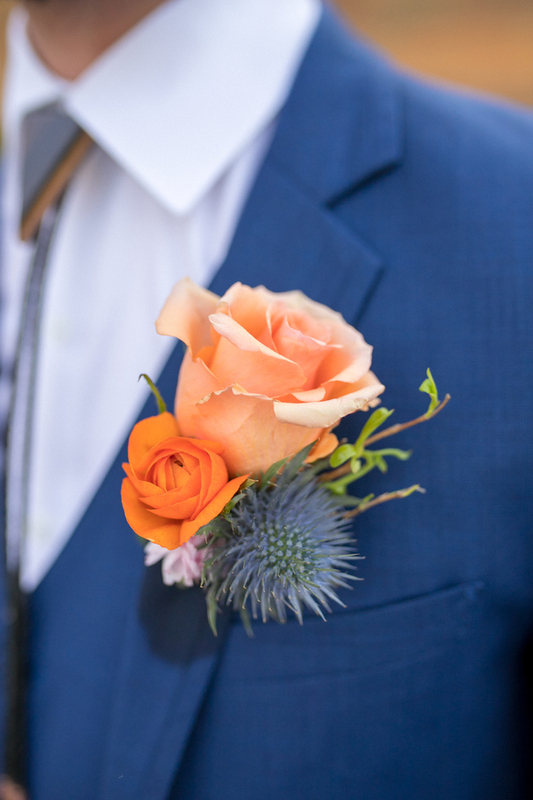 Skipping a tie on your groom’s look is an easy and efficient way to achieve that casual, laid-back look you are searching for. 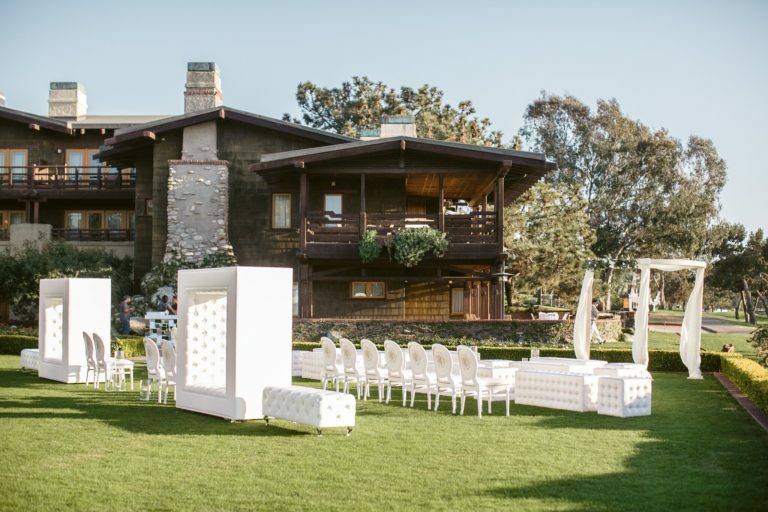 Founder and Lead Designer of Couture Events, Krystal Tien says "The Lodge at Torrey Pines is one of our favorite venues in San Diego! 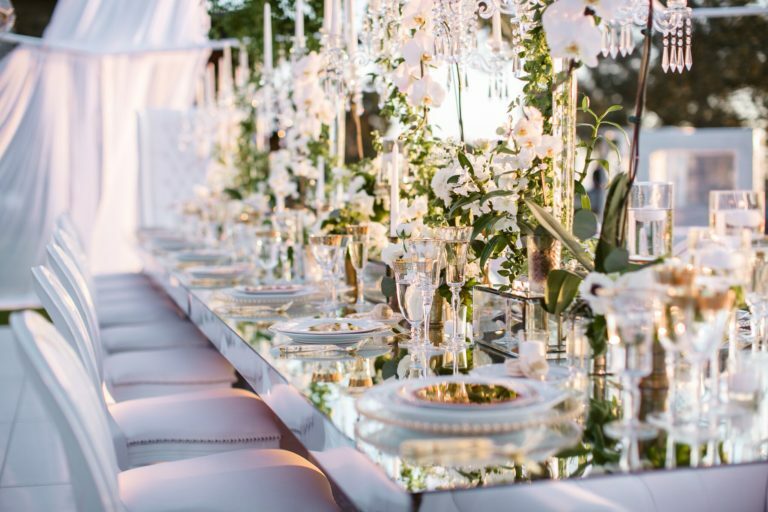 We love an intimate wedding full of details and luxuries and this was just that! 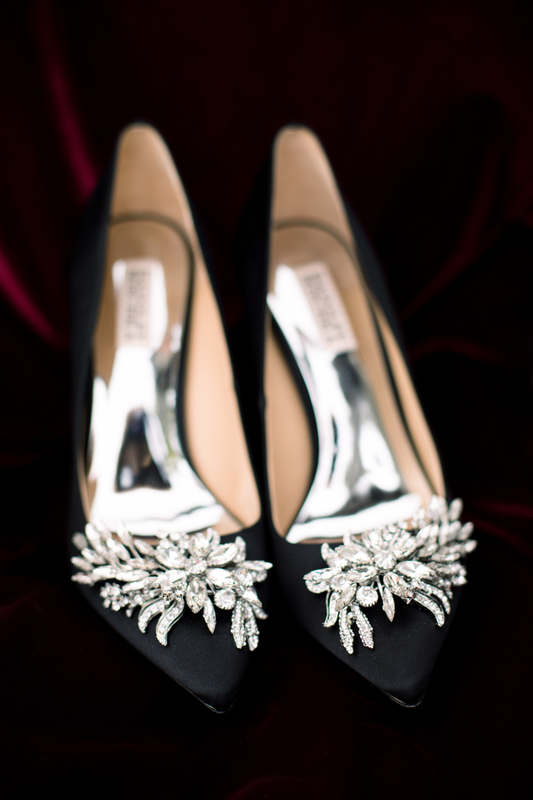 Renowned photographer Jasmine Star captured every detail so perfectly. 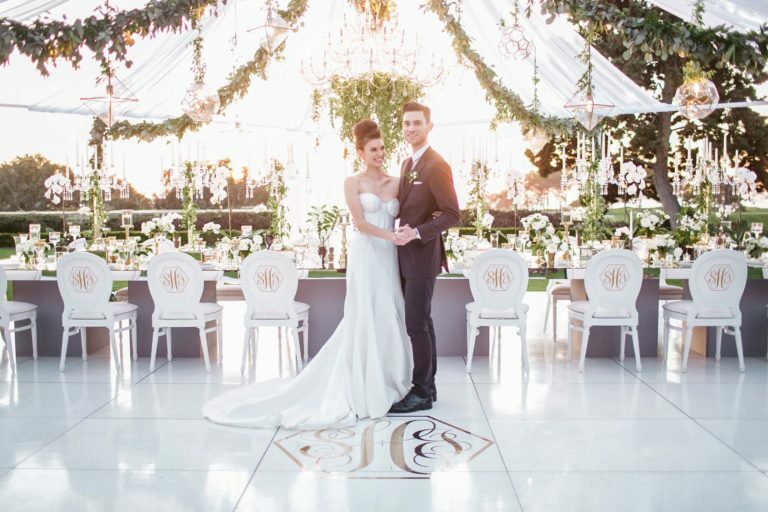 A lounge ceremony, white tufted cocktail hour, geometric light fixtures and menus, monogrammed chairs, and chandeliers dripping in vines!" 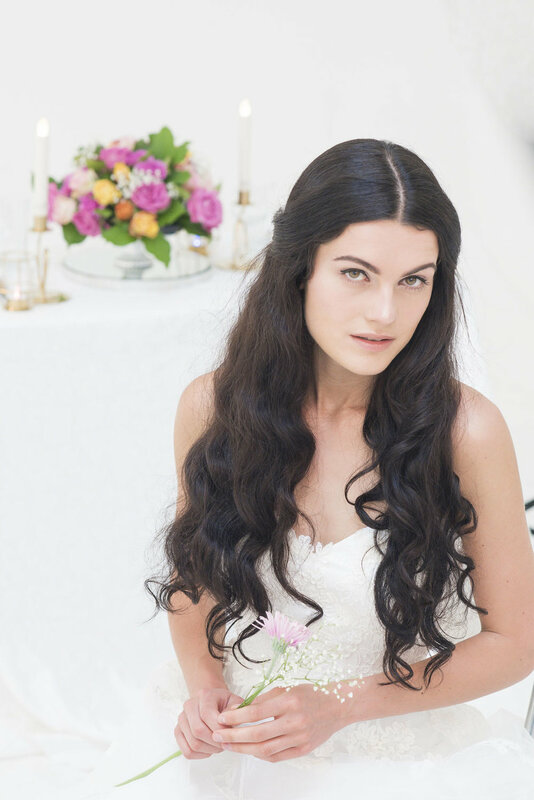 We just love this fresh, young, romantic styling that brigs all the drama but without any heaviness, we call it "glam nouveau!" 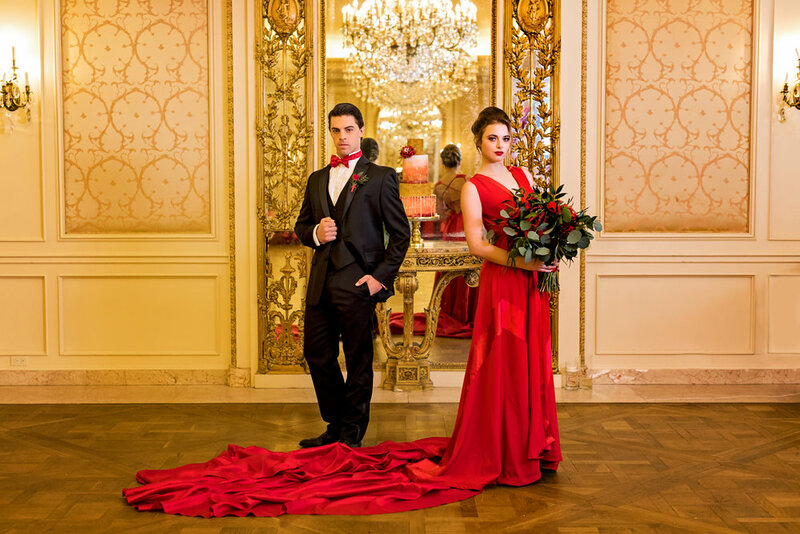 Couture Events is a boutique event styling & coordination studio. 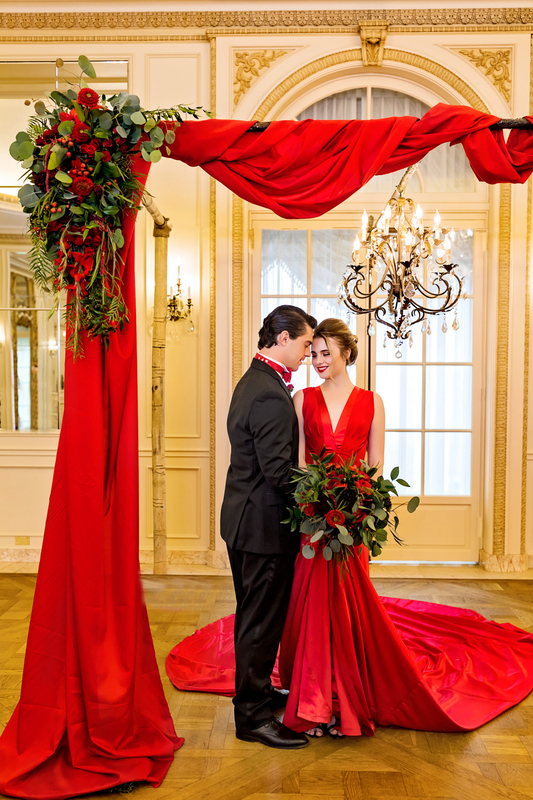 Similar to a couture gown, each of their Couture Weddings & Events is designed to custom fit their client's unique style and personality. 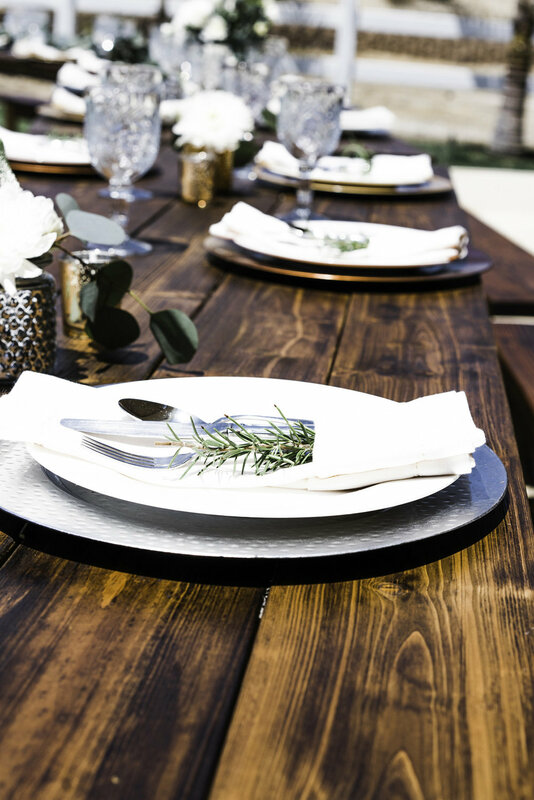 Based in Southern California we serve San Diego, Orange County, Los Angeles, and Palm Springs!